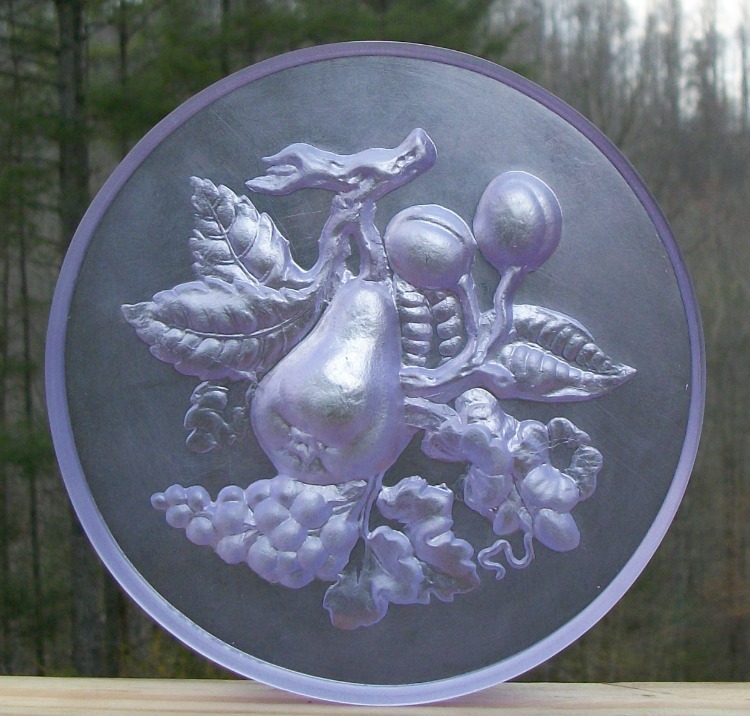 Welcome to The Springerle Baker’s on-line catalog for Fruit & Nut molds. 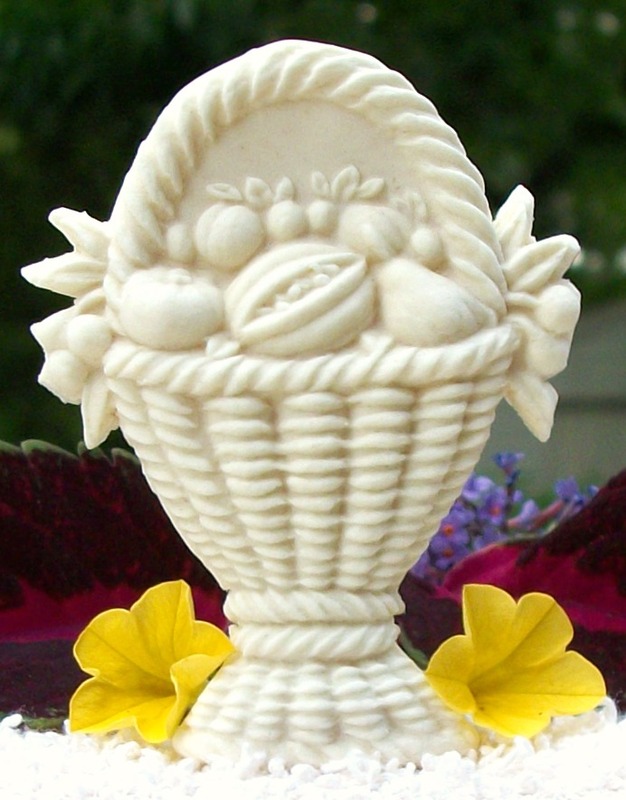 This mold delivers an image of a tall basket of vegetables and fruits and measures about 3 3/8” x 2 1/2″. The image is detailed and will add an unusual subject to your cookie display. The original image was taken from a large multi image board that was carved in the 1700’s. This mold is #1758 and sells for $31.65. 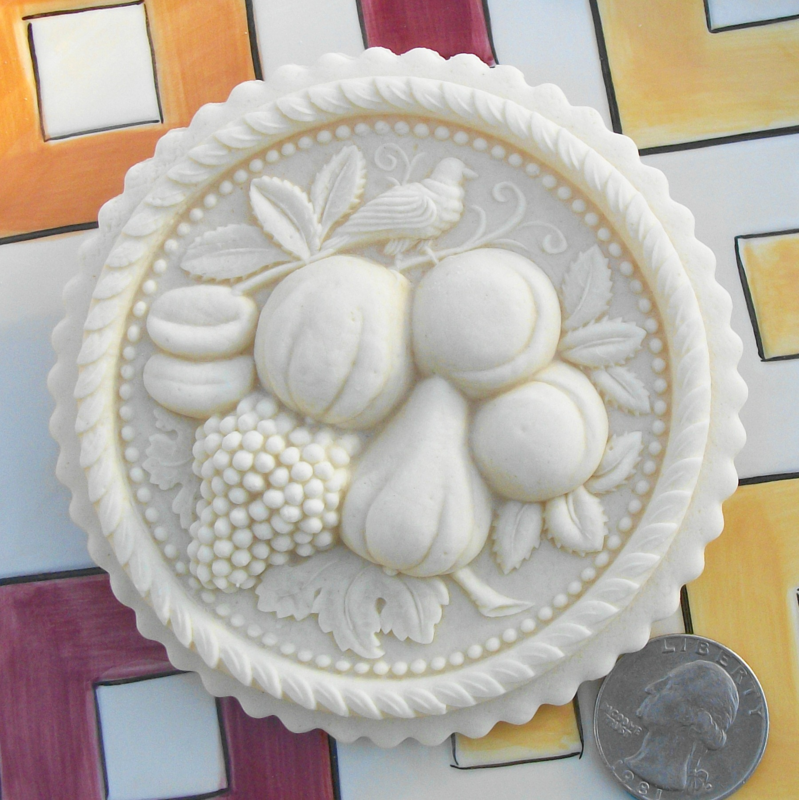 This mold measuring about 3 1/8” in diameter features a cornucopia filled with fruits. A symbol of abundance and replenishment. The depth of the images is great and the details are fine. The border adds a good dimension to round off a truly beautiful image. The mold will produce a nice cup cake topper. 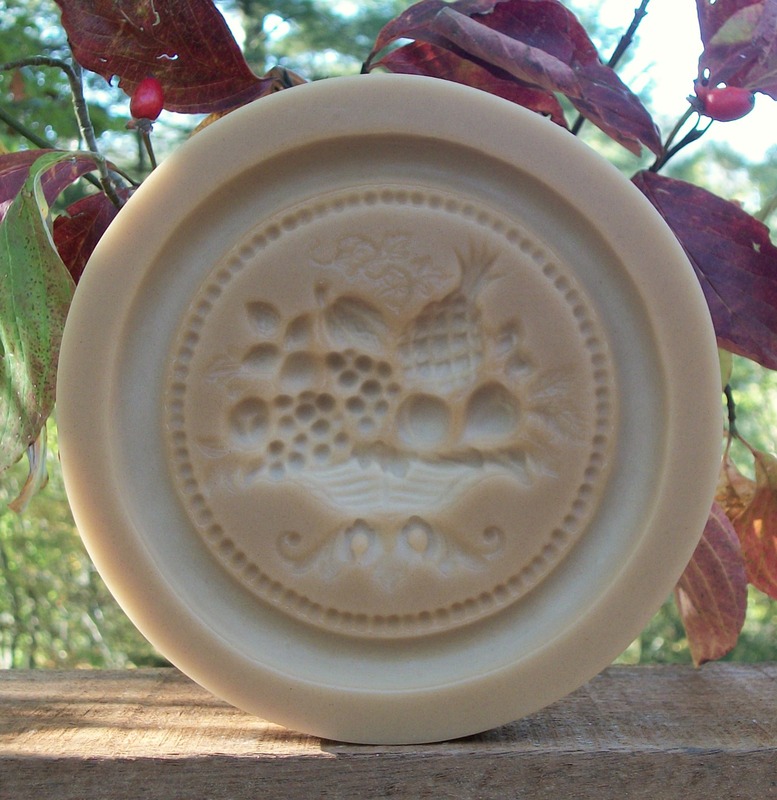 This mold is #1674 and sells for $35.40. 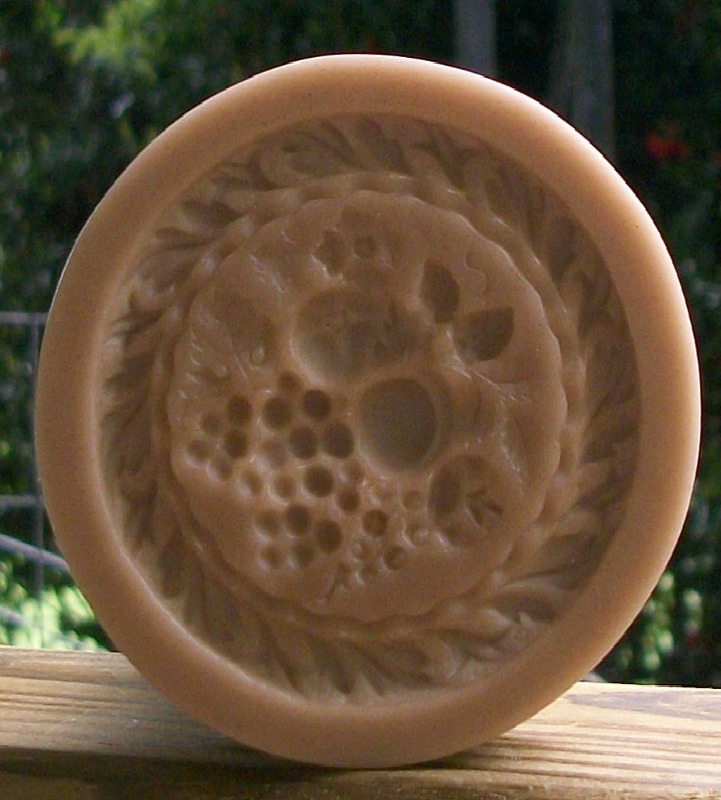 This mold is also available in a smaller size (#419). #1674 Cookie and #1674 cookie trimmed close. 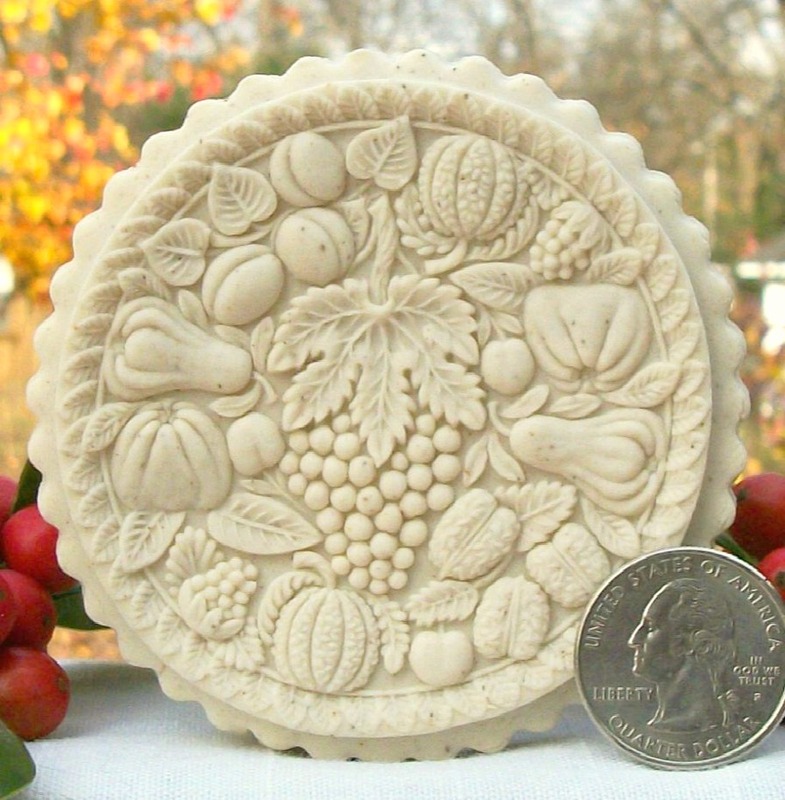 #419 Small Calw Cornucopia Mold – $21.75. 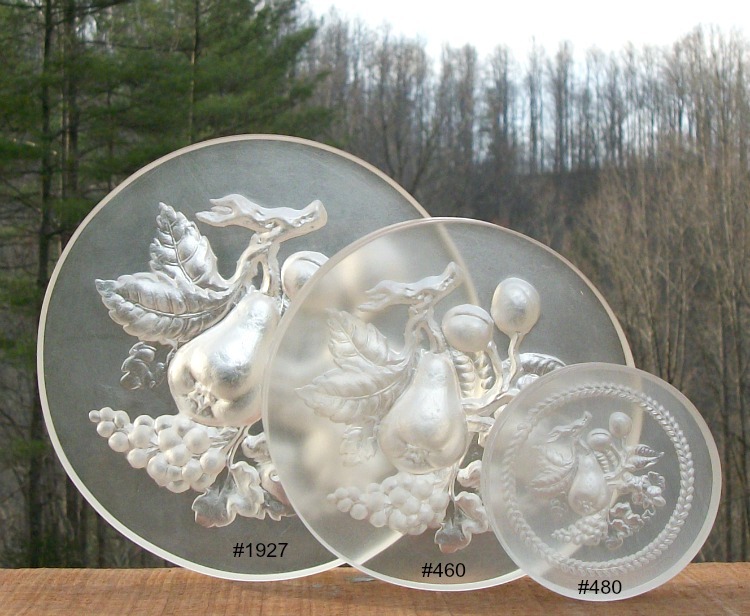 This is the smaller version of our mold #1674. 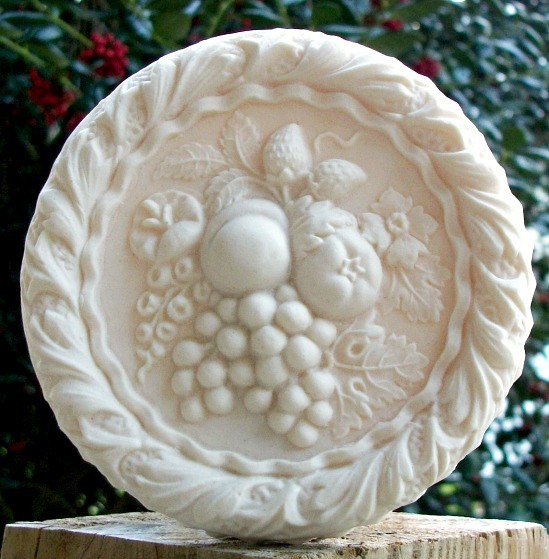 This mold measures about 1 7/8” in diameter features a cornucopia filled with fruits; a symbol of abundance and replenishment. The depth of the images is great and the details are fine. The border adds a good dimension to round off a truly beautiful image. This mold is a smaller version of #1674. The bigger version is great to make a cup cake topper while this smaller mold will produce very detailed and dimensional cookies and confections. This mold is #419 and sells for $21.75. Cookie made with mold #419. 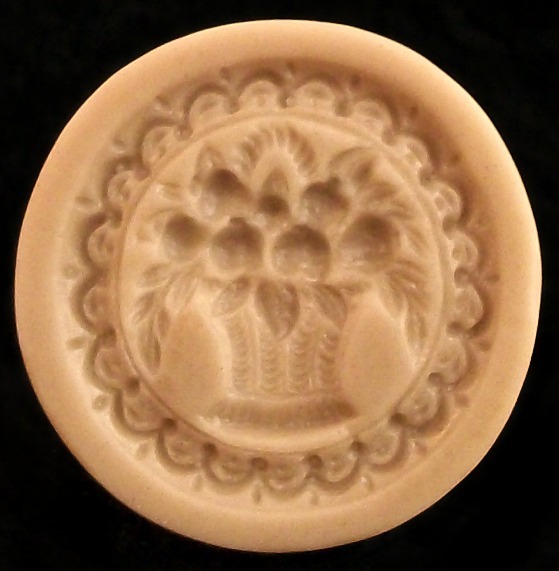 This is a smaller, beautiful acorn mold with great detail and depth. 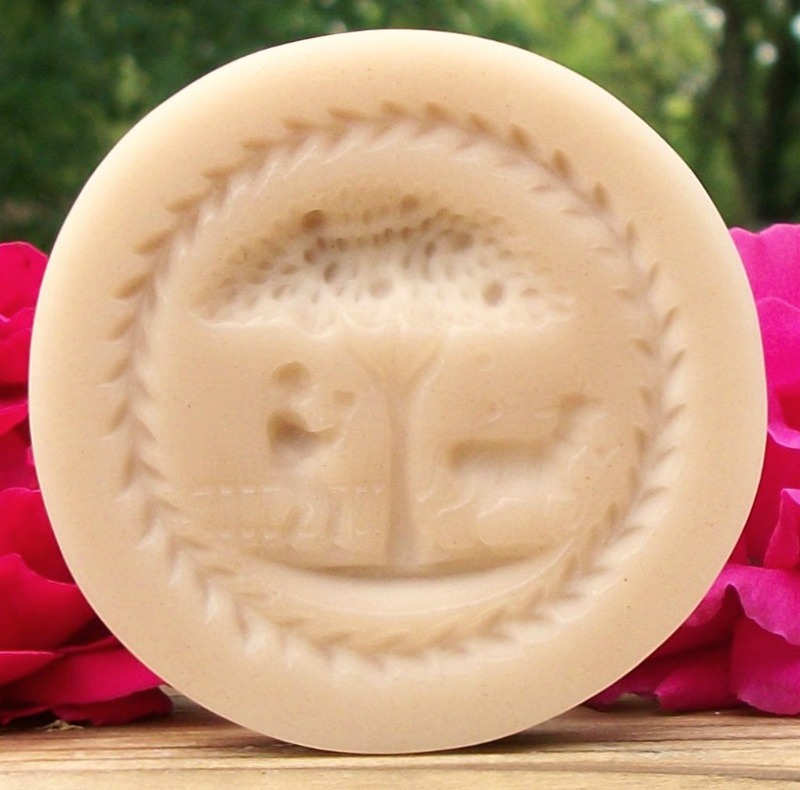 The acorn has for centuries been associated with good luck, strength, and durability. In Christianity it is also said to symbolize divine guidance and spiritual growth. 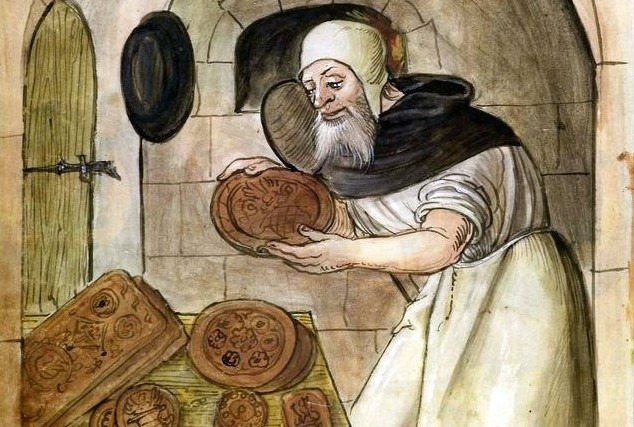 It has a groove around it to assist in removing it from the dough. The mold measures about 2 7/16” with the image area measuring about 1 15/16″. It’s a great size for cookies, marzipan, other confections and ornaments. This mold is #518 and sells for $34.17. 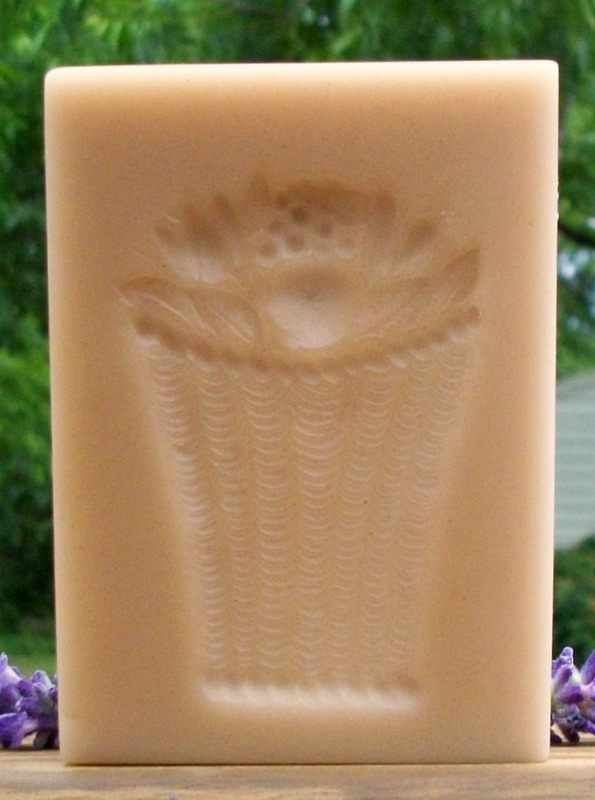 A clear or color tinted copy of this mold will cost an extra $4.27. Cookies made with mold #518. 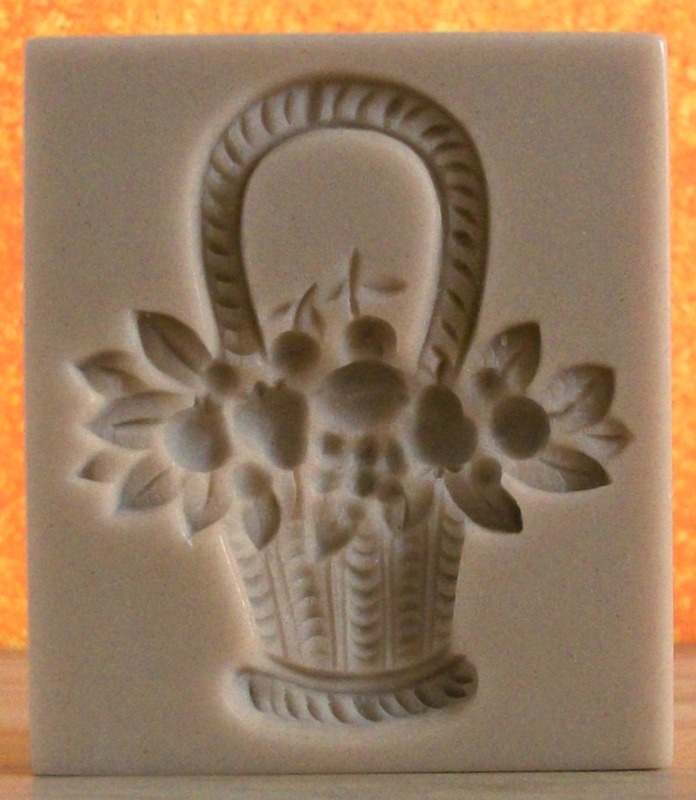 #1845 Heidenheim Fruit Basket Mold – $21.45. 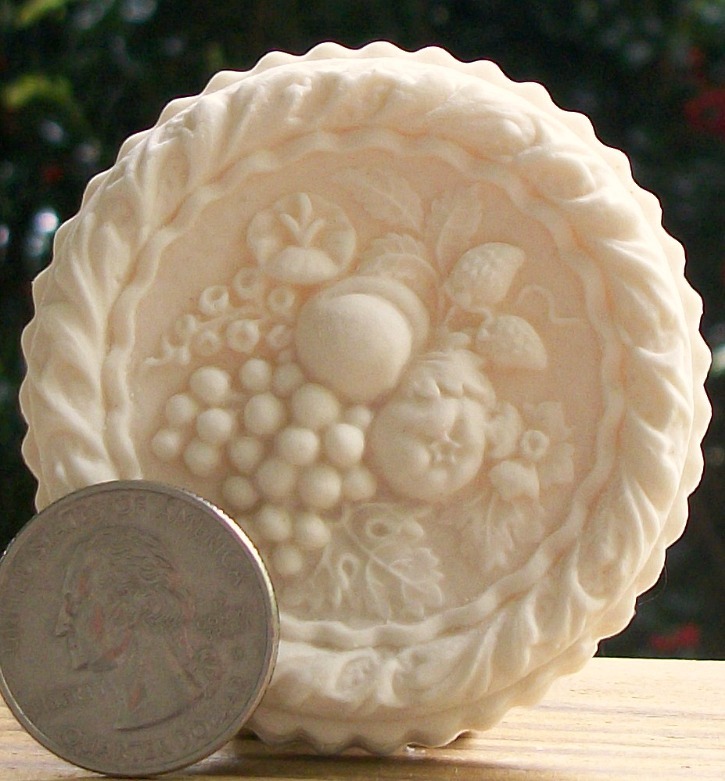 This mold of mixed fruits measures about 5” in diameter and has excellent details, depth and beauty. The design is a mixture of fruits, berries and flowers and the very ornate border design of leaves really provides a spectacular look. Between the center motif and the border design is a different design that really ties the whole image together. 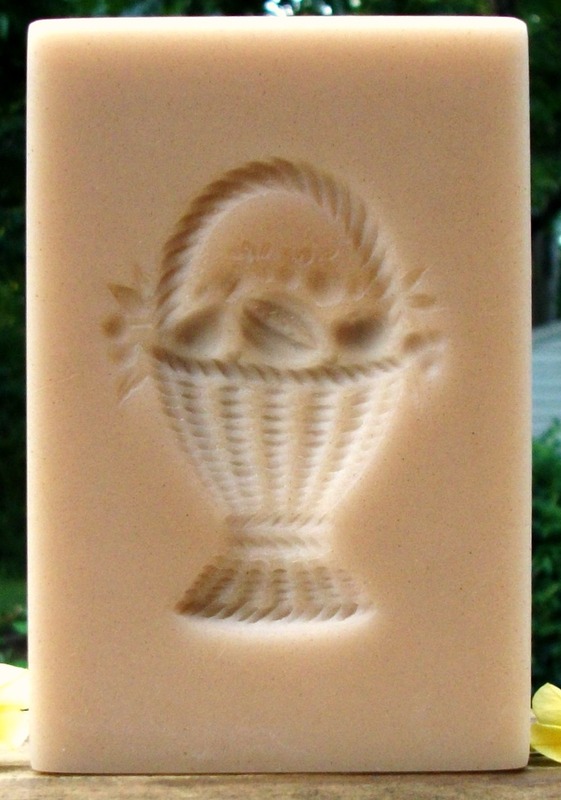 Originally designed for use with marzipan, this mold can also be used with Springerle and other cookie dough’s that hold an image well. 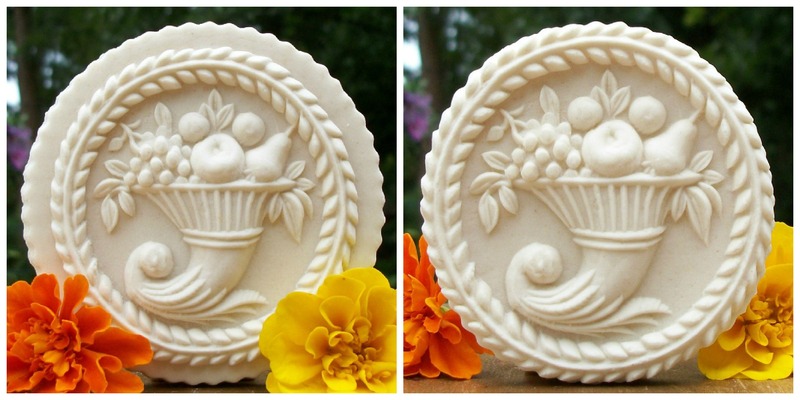 With marzipan or fondant, this will make a beautiful image to top a small cake or large muffin. If painted with edible colors this would make a work of edible art! 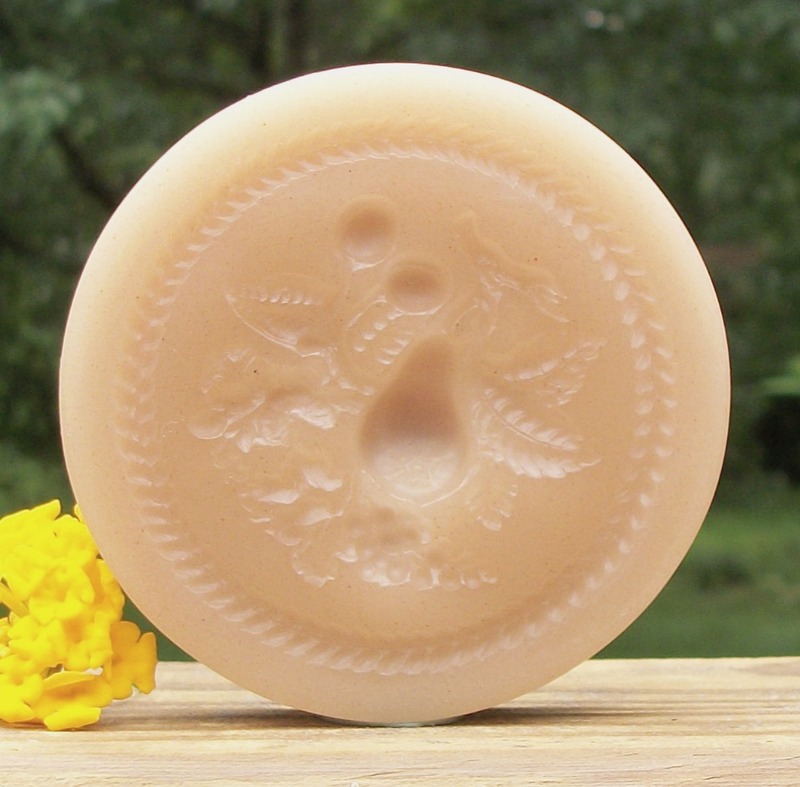 The original mold was sent to us by Frau Bläsius from Koblenz Germany. This mold is #1923 and sells for $48.50. 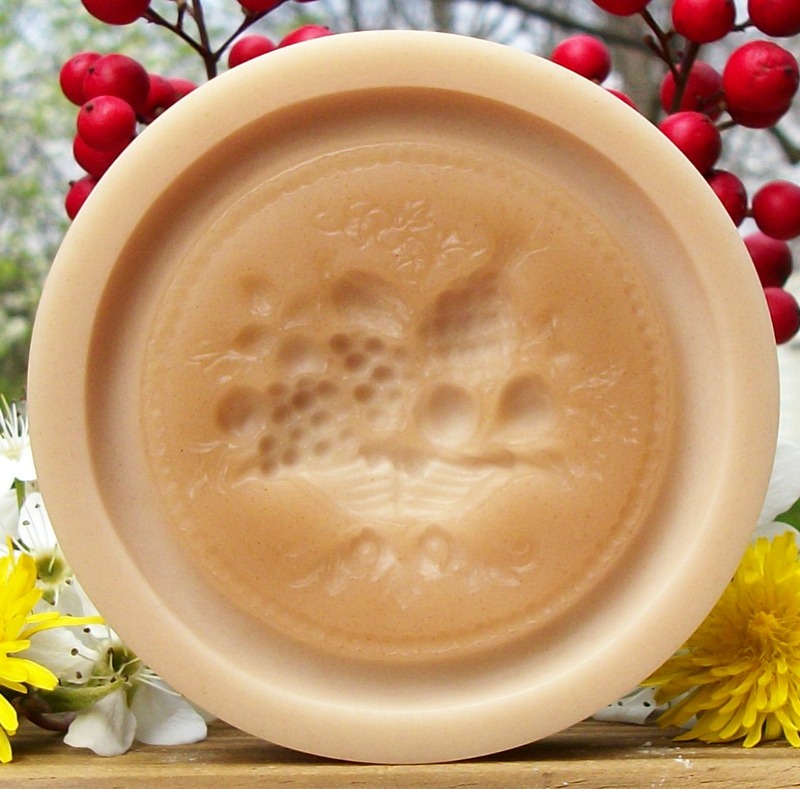 This mold is also available in a smaller size (#422). 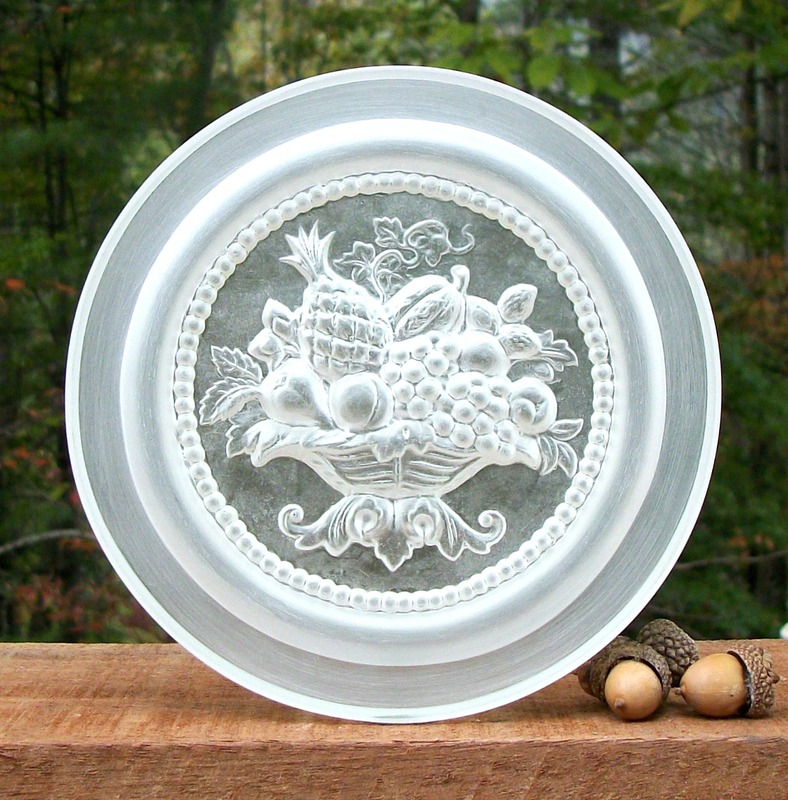 #422 Small Koblenz Mixed Fruits Mold – $31.65. 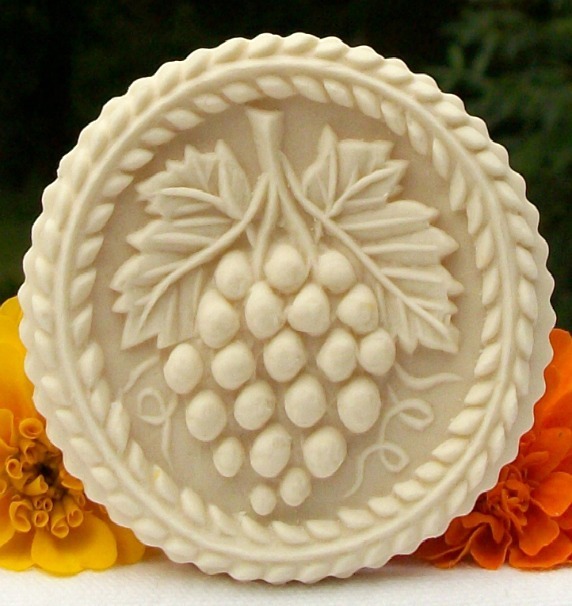 This mold of mixed fruits measures about 2 5/8” in diameter and has excellent details, depth and beauty. The design is a mixture of fruits, berries and flowers and the very ornate border design of leaves really provides a spectacular look. Between the center motif and the border design is a different design that really ties the whole image together. 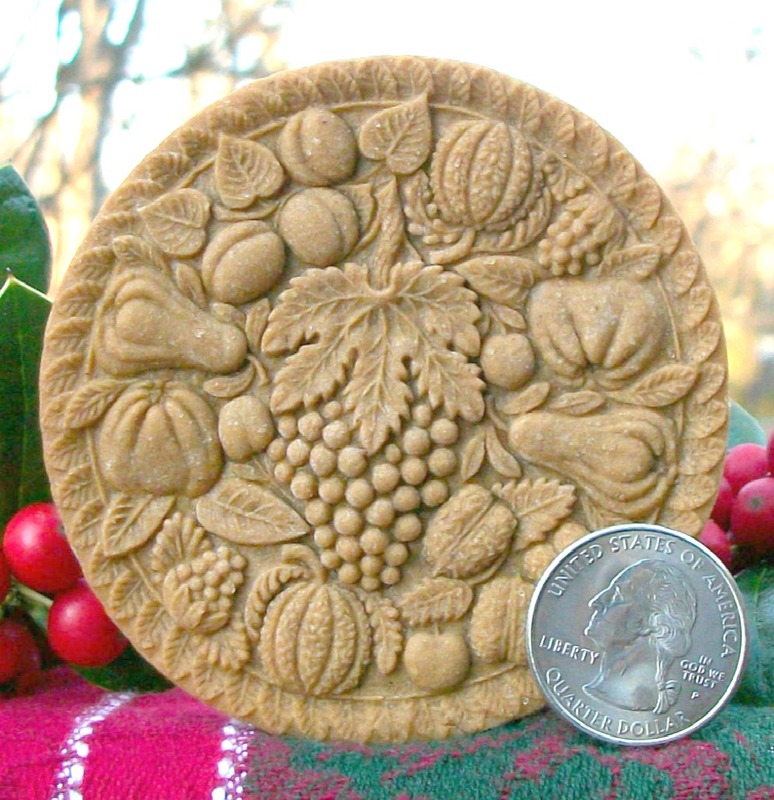 Originally designed for use with marzipan, this mold can also be used with Springerle and other cookie dough’s that hold an image well. 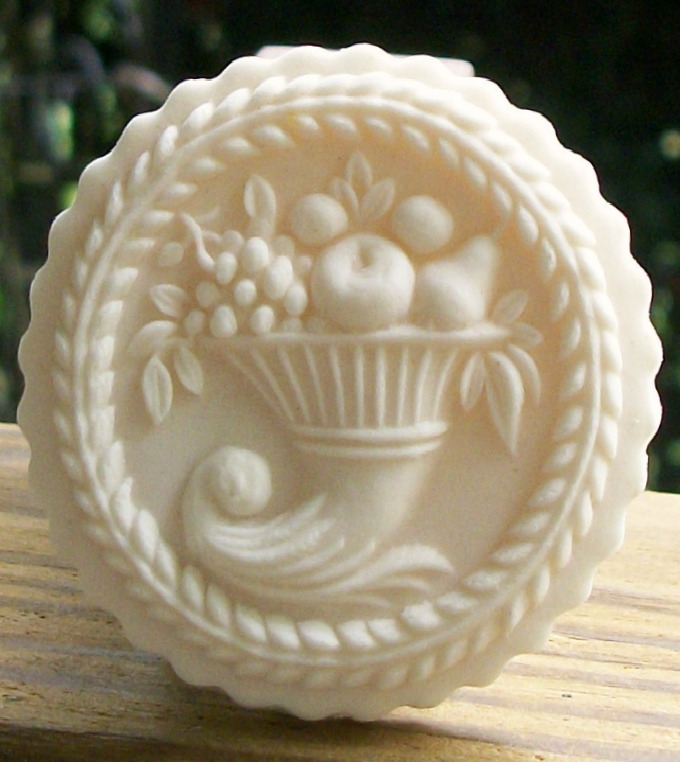 With marzipan or fondant, this will make a beautiful image to top a cup cake. If painted with edible colors this would make a work of edible art! This mold is a smaller version of #1923. This mold is #422 and sells for $31.65. Cookie made with mold #422. This mold measures about 6” in diameter and produces a cookie that measures about 5 3/8” in diameter. 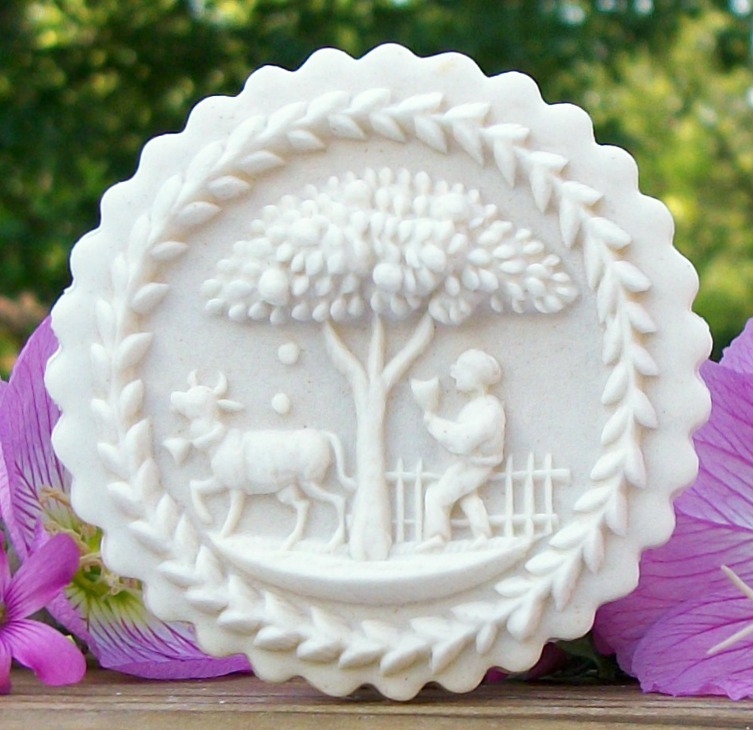 The cookie produced from this mold is a beautiful work of culinary art. 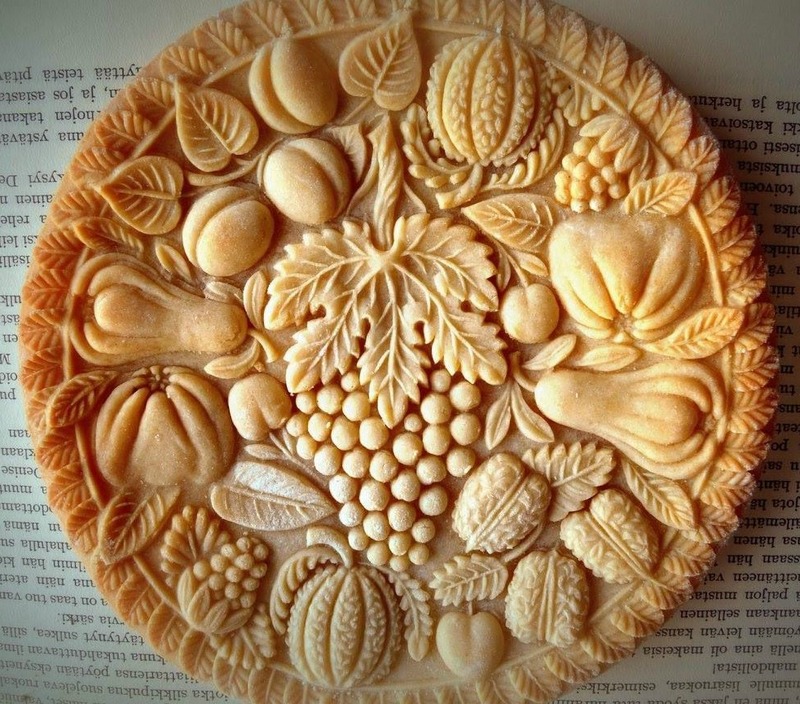 It is covered with pears, persimmons, plums, grapes, walnuts, apples and leaves. All of which stand out with great detail, depth and dimensions. These images were originally carved back in the Baroque period. 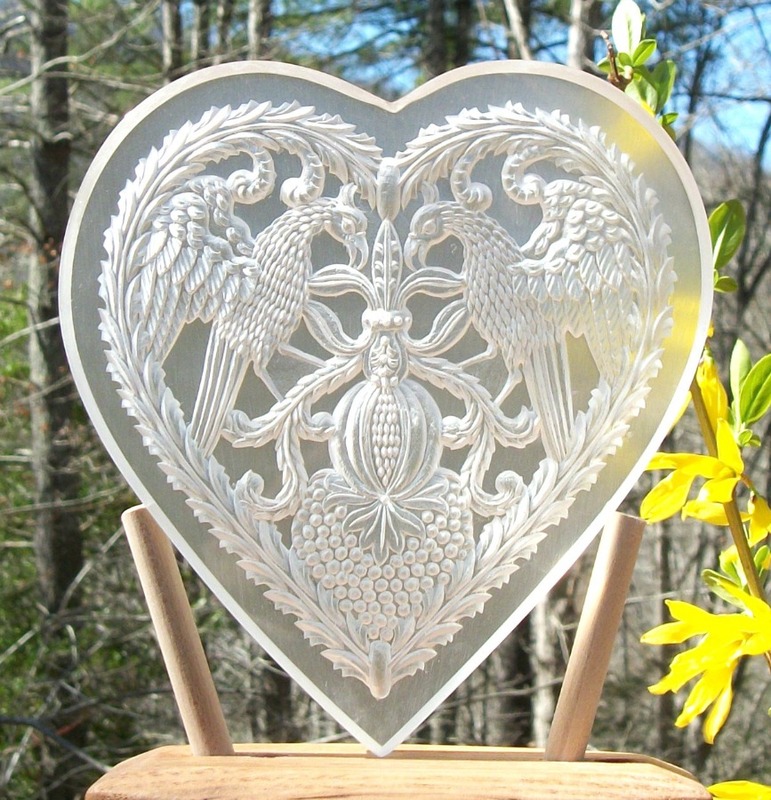 A beautiful Gingerbread, or small cake topper can be produced from this mold. Tinted with edible colors it would become a true edible masterpiece. This mold is #444 and sells for $71.25. 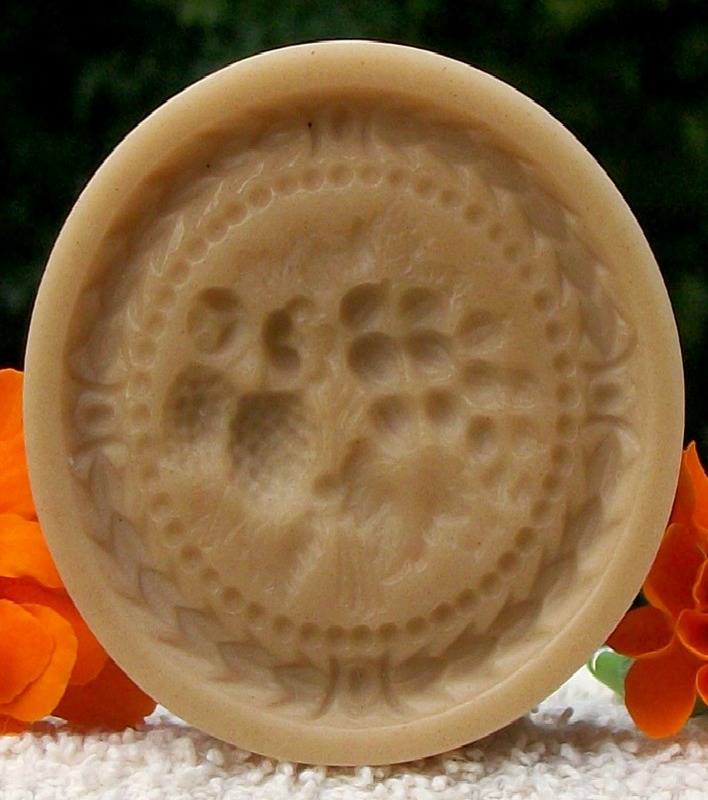 This mold is also available in a smaller size (#450). A Frankfurter Brenten cookie made with mold #444 Junior Baroque Fruit and Nut by Petrus Kurppa. Gingerbread cookie made with mold #444. 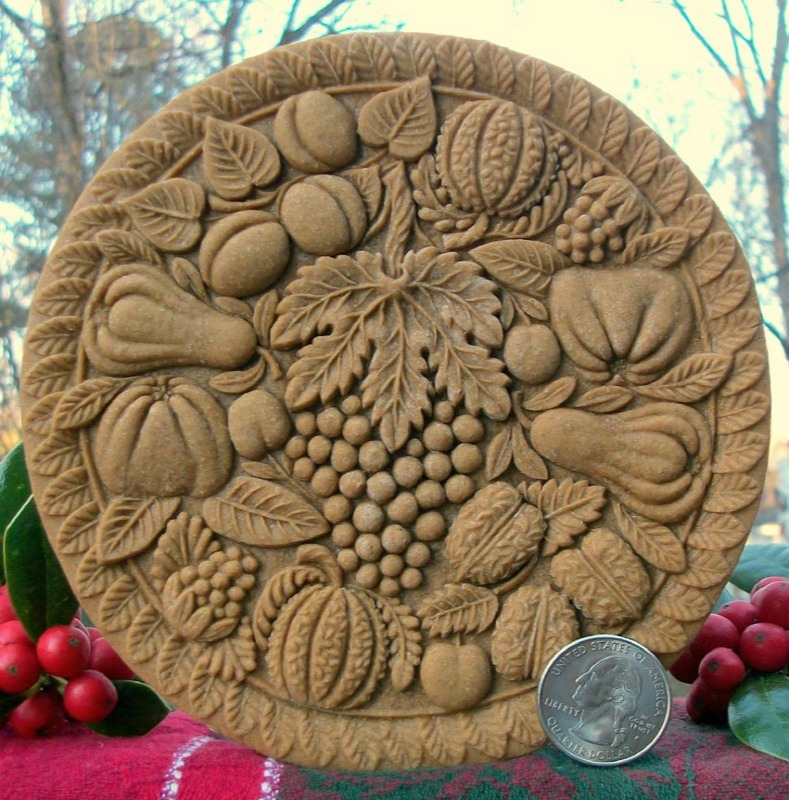 #450 Small Baroque Fruit and Nut Mold in Brown. This mold measures about 3 3/16” in diameter. 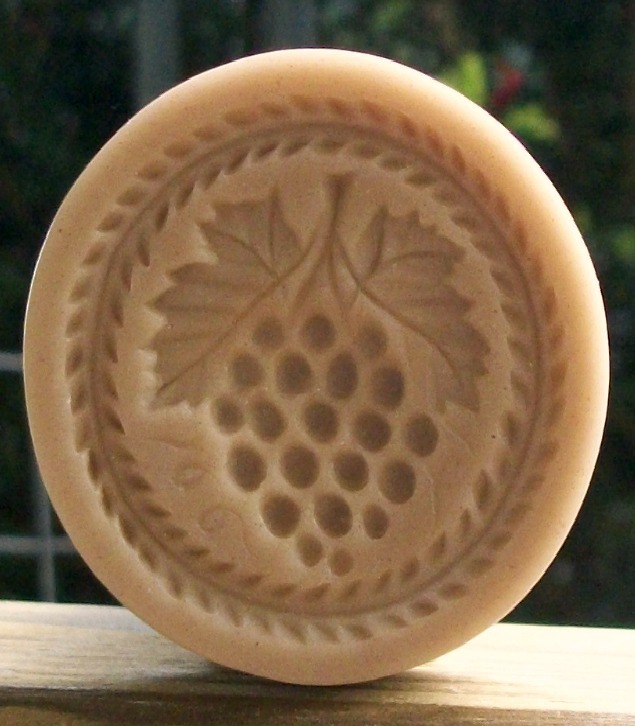 The cookie produced from this mold is very detailed with great depth and dimensions. A great size for a cookie tray or dessert display. 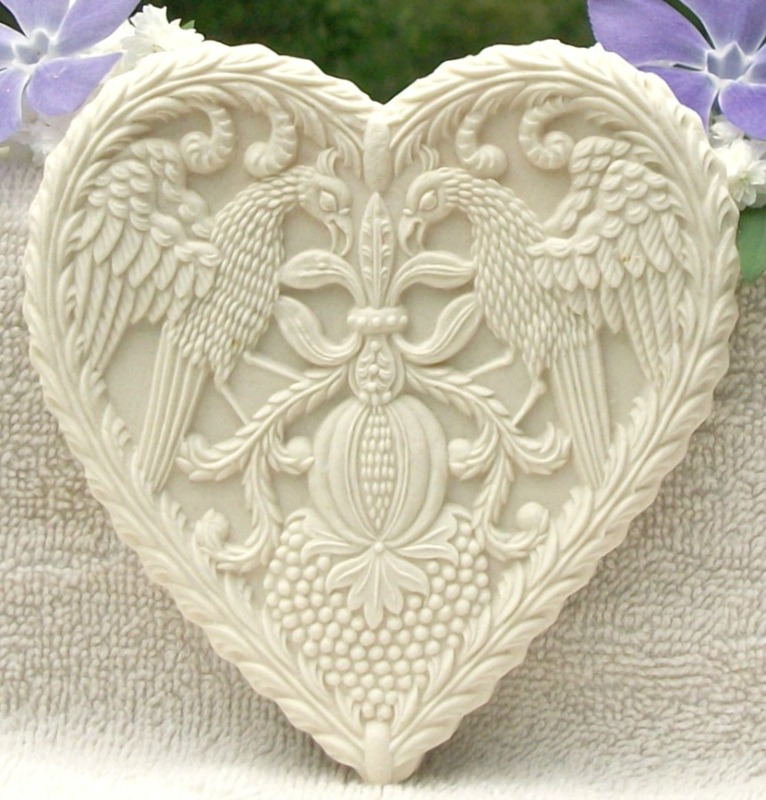 The original mold was carved back in the Baroque period. 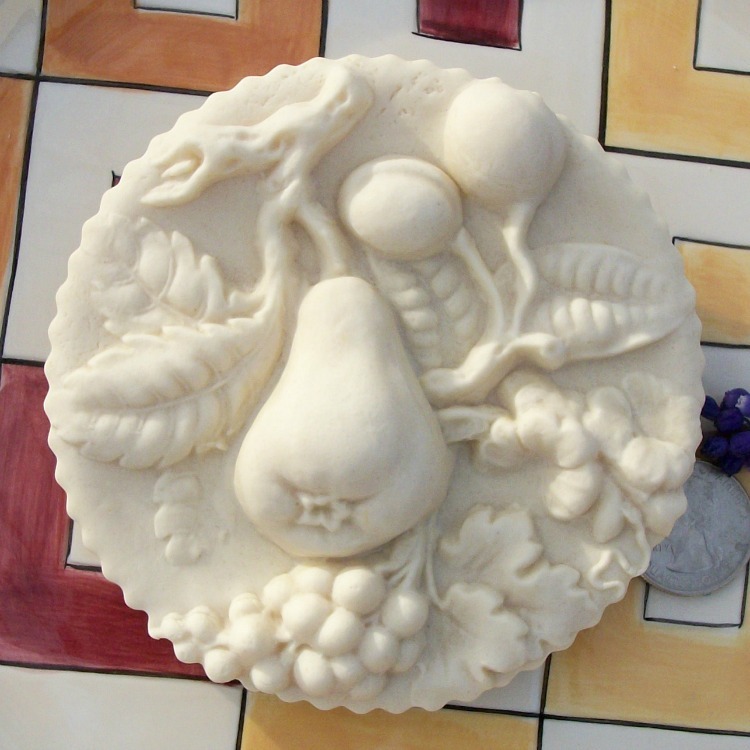 Pears, persimmons, plums, grapes, walnuts, apples and leaves all adorn this beautiful mold. 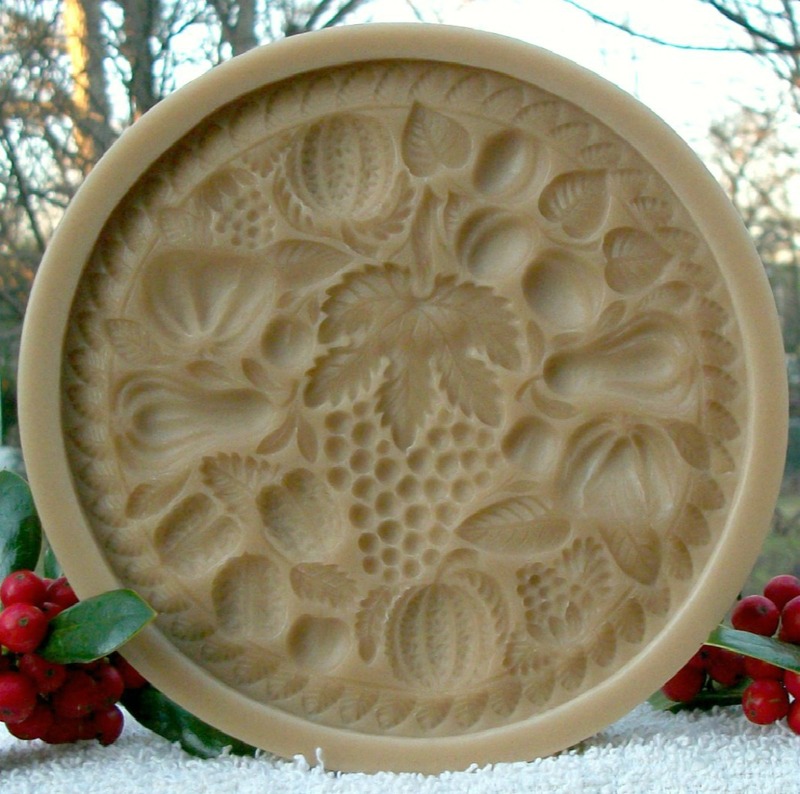 A beautiful Gingerbread can be produced from this mold and tinted with edible colors would make an edible masterpiece. 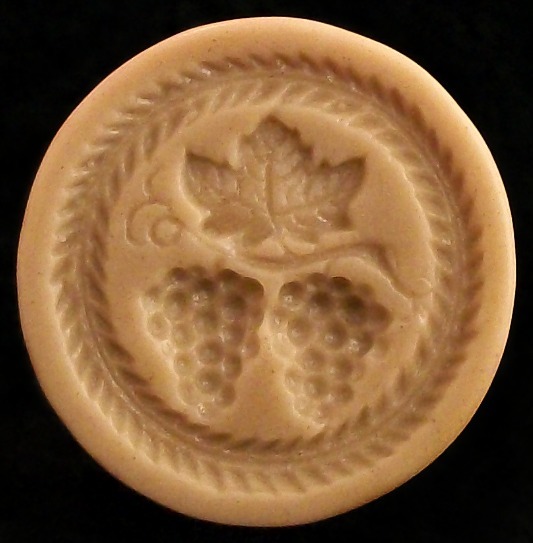 You can also use this mold for Springerle, Marzipan and other confections. 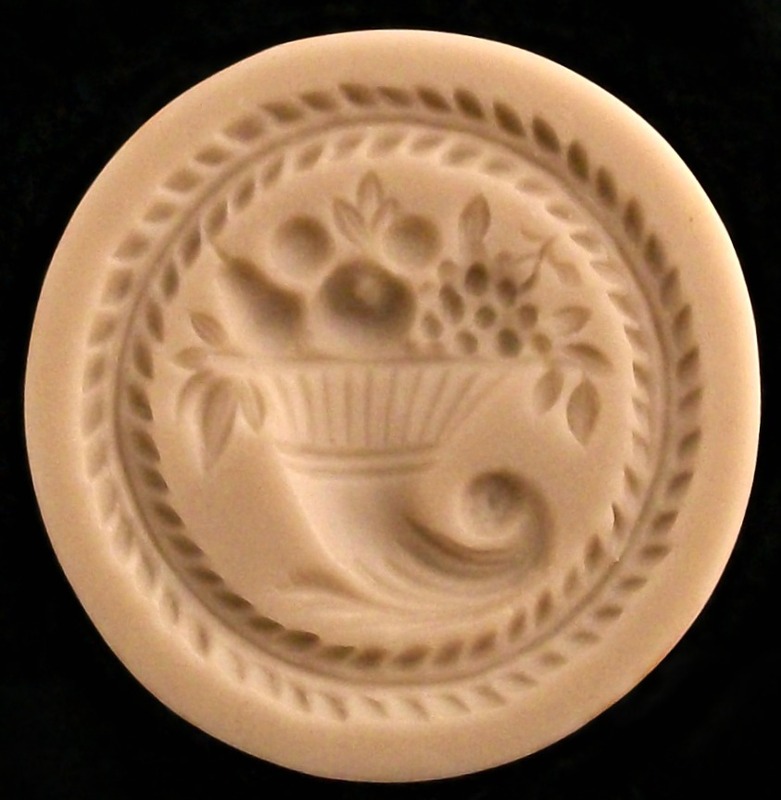 Consider using this mold to produce a topper for a spiced cup cake! This mold is #450 and sells for $33.46. The original mold can seen here. 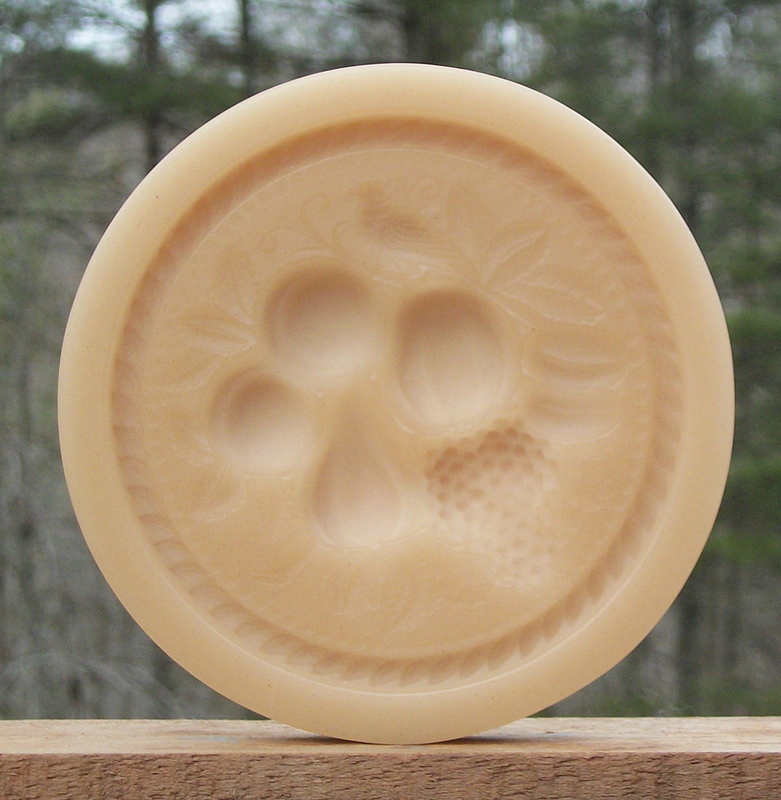 This is the smaller version of our mold #444. Gingerbread cookie made with mold #450. #450 in Light Blue, Clear, and Yellow. #450 Sharon Rose, Pink, and Violet. 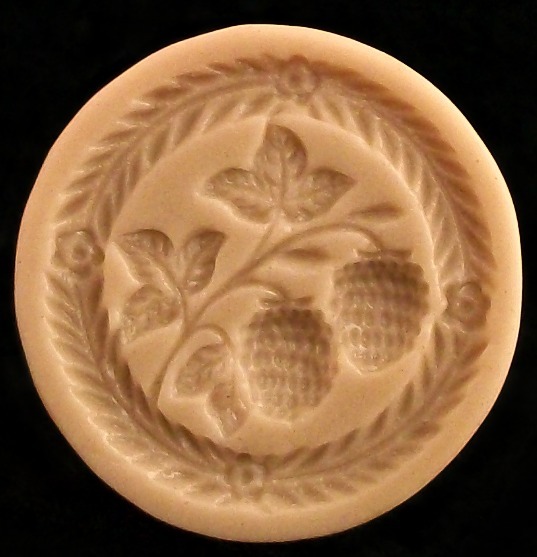 #1916 Stade Berries Marzipan Mold – $42.95. 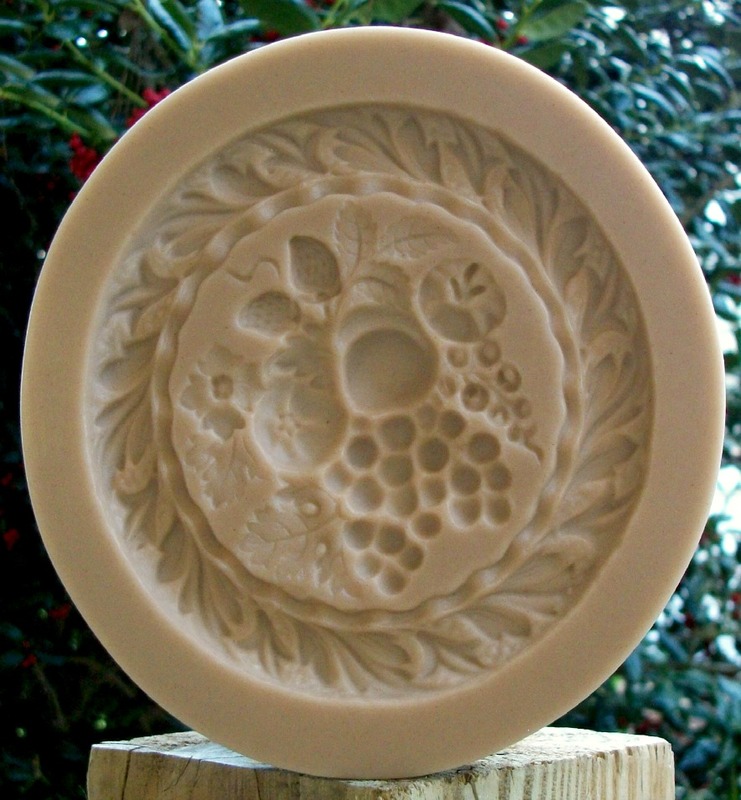 This mold measures about 4 1/2″ in diameter and produces a deep image with berries, flowers and leaves. 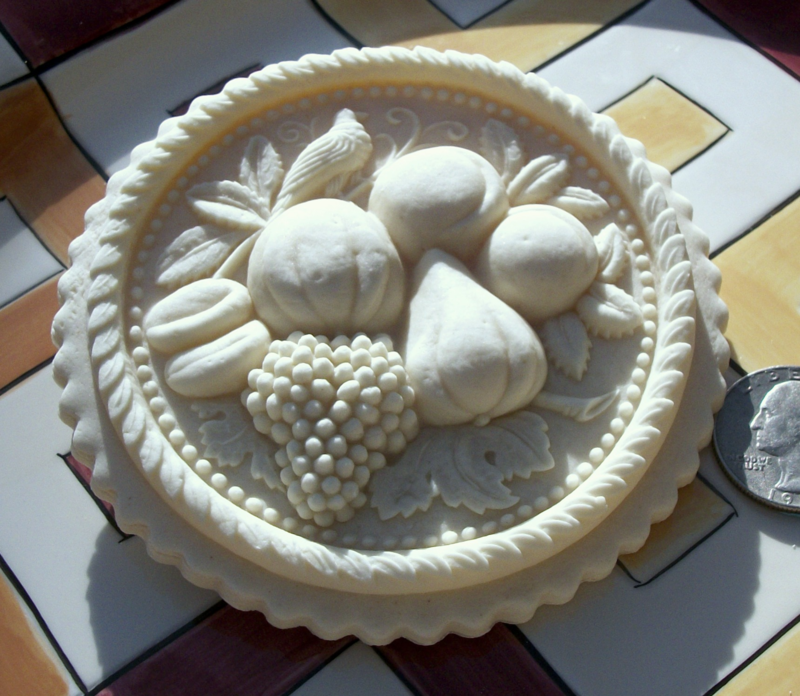 The original mold was intended for use with Marzipan, but I found that the mold can very successfully be used with Springerle dough too. 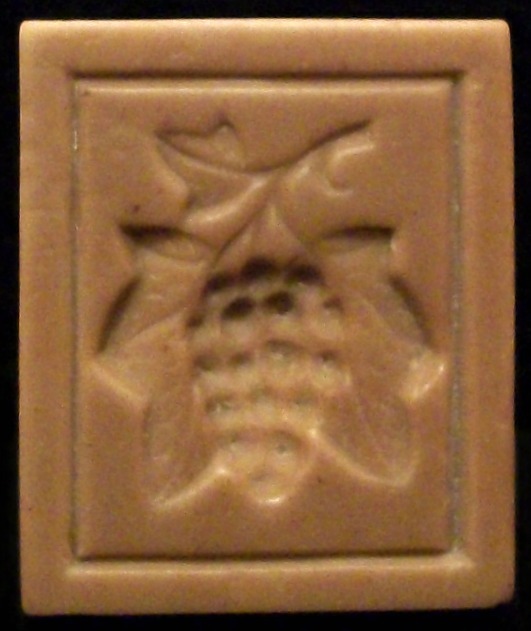 The original mold is part of a collection of molds that were used in a familie bakery in Stade, Germany from about 1900 until around 1990. 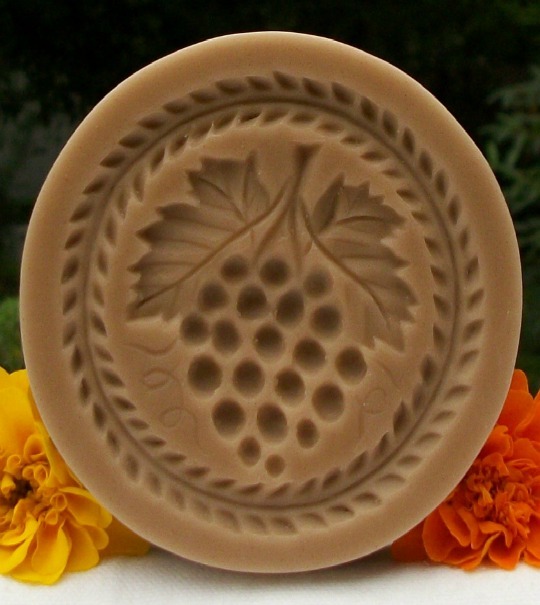 This mold would also produce a beautiful topper for a small cake. This mold is #1916 and sells for $42.95. 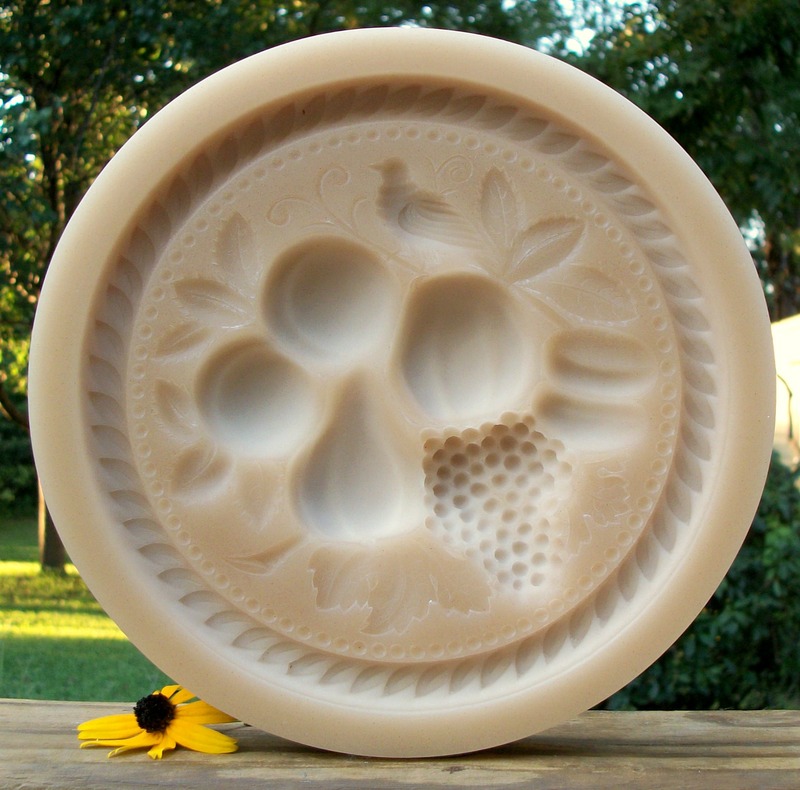 This mold is also available in a smaller size (#439). Cookie made with mold #1916. 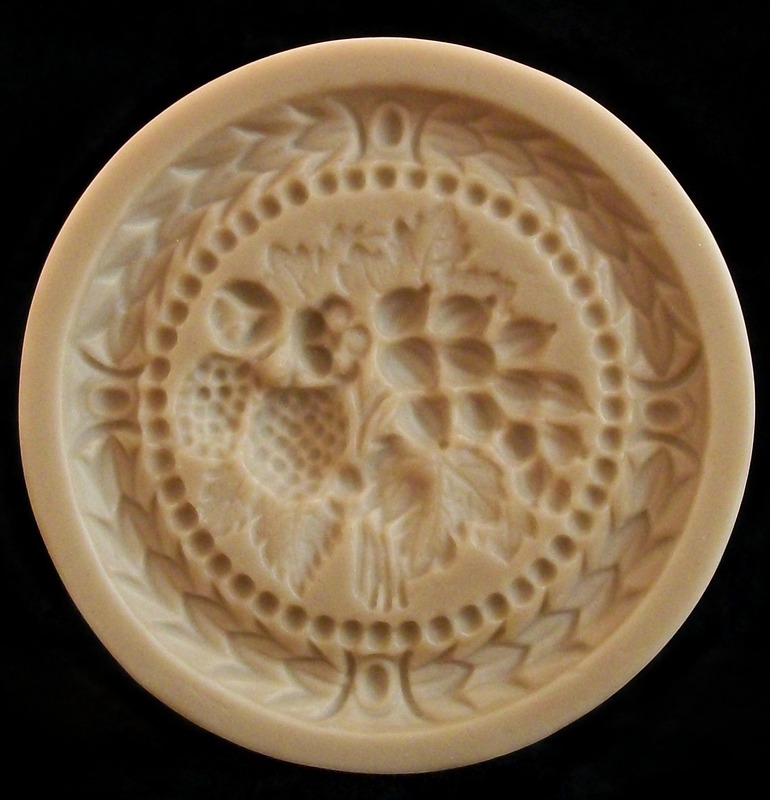 This mold measures about 2 1/8″ in diameter and produces a very deep and detailed image with berries, flowers and leaves. 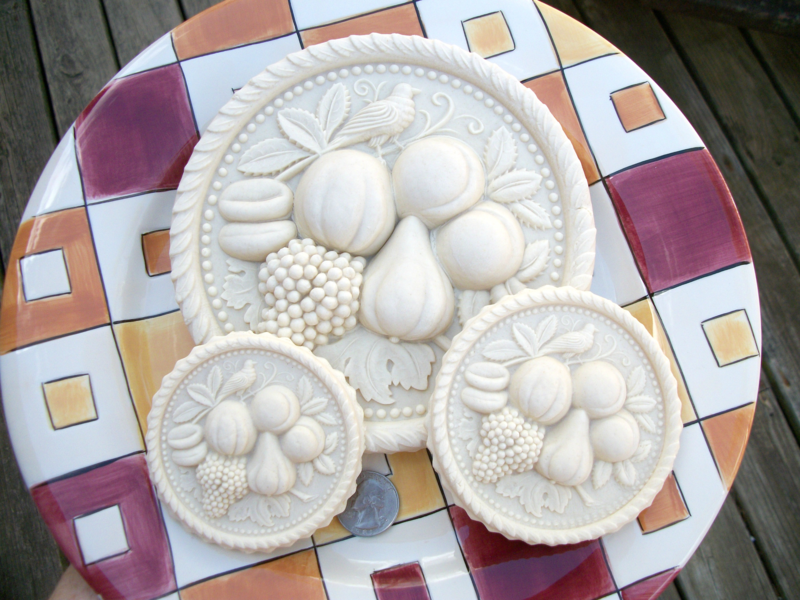 The original mold was intended for use with Marzipan but I found that the mold can very successfully be used with Springerle dough. 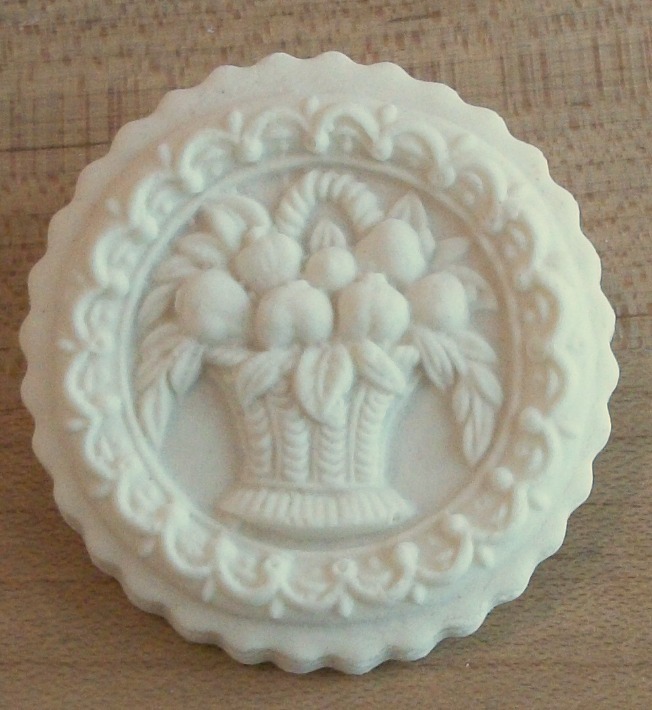 The original mold is part of a collection of molds that were used in a family bakery in Stade Germany from about 1900 until around 1990. 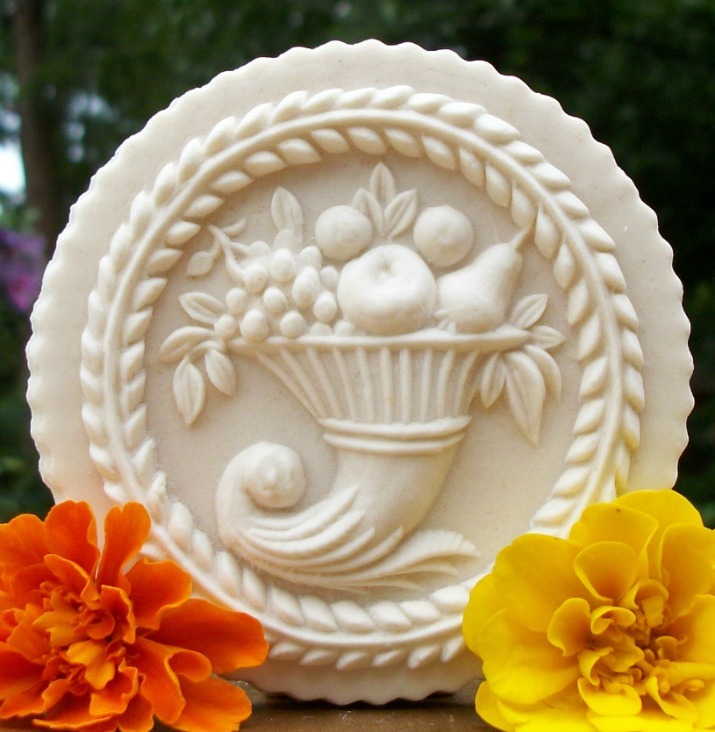 With marzipan or fondant, this will make a beautiful image to top a cup cake. This mold is a smaller version of #1916. This mold is # and sells for $31.42. Cookie made with mold #439 trimmed close. #439 Cookie and a trimmed close cookie. The following mold is available in 3 sizes. 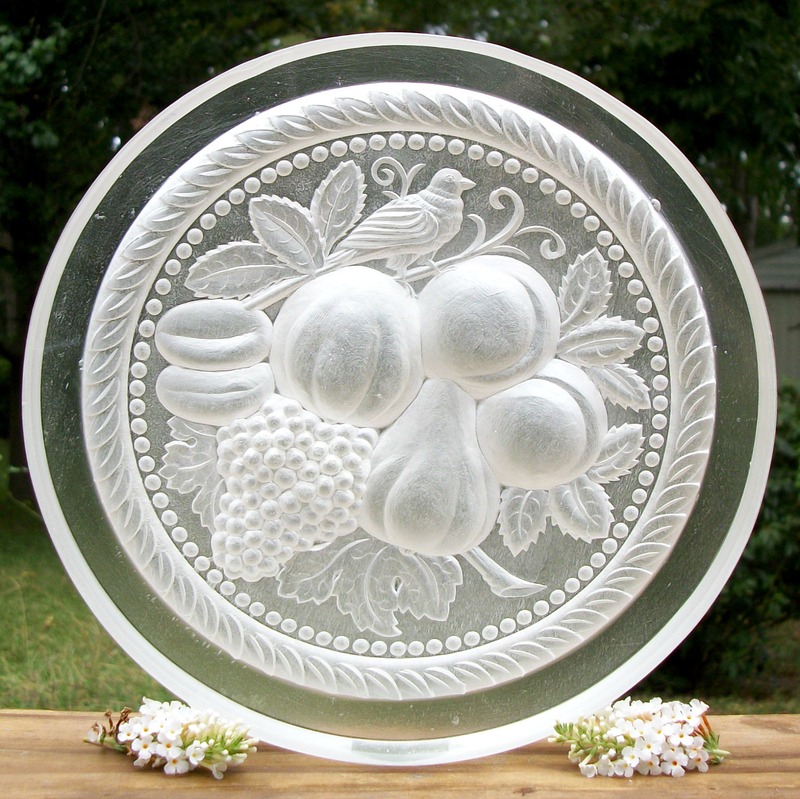 This mold measures about 2 3/4″ in diameter and features a pear with plums and grapes. The image is very deep and nicely detailed with not only the fruits but leaves and a branch also. The pear and fruits stand right up off the cookie. 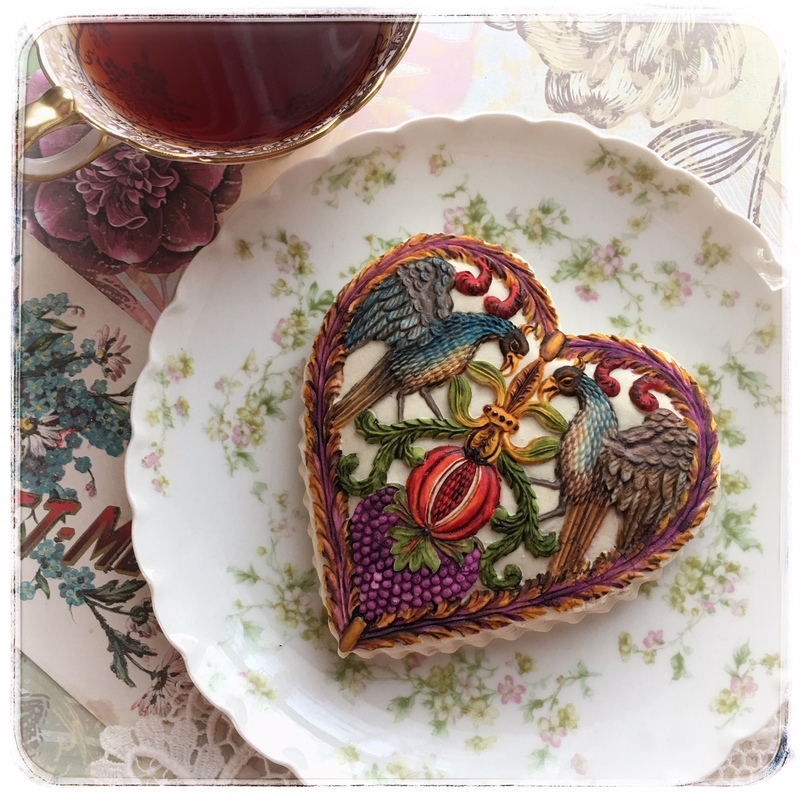 Painted with edible colors, this cookie would be a great eye catcher on your cookie tray or dessert display. There is a nice herringbone design that encircles and compliments the whole design. This mold has a groove around its side to help assist in lifting after pressing. This mold is #480 and sells for $33.12. 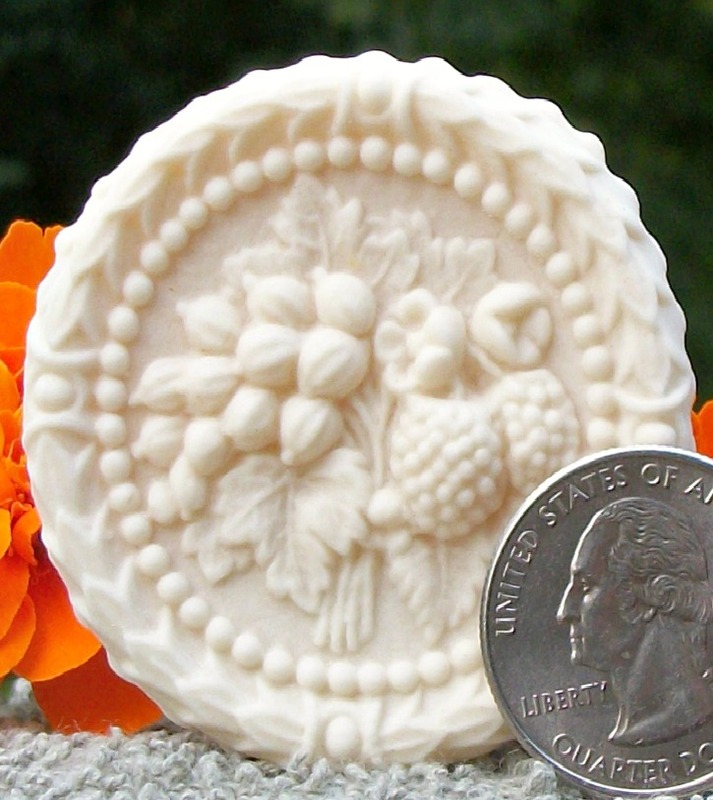 Clear and color copies of this mold will cost an additional $4.14. 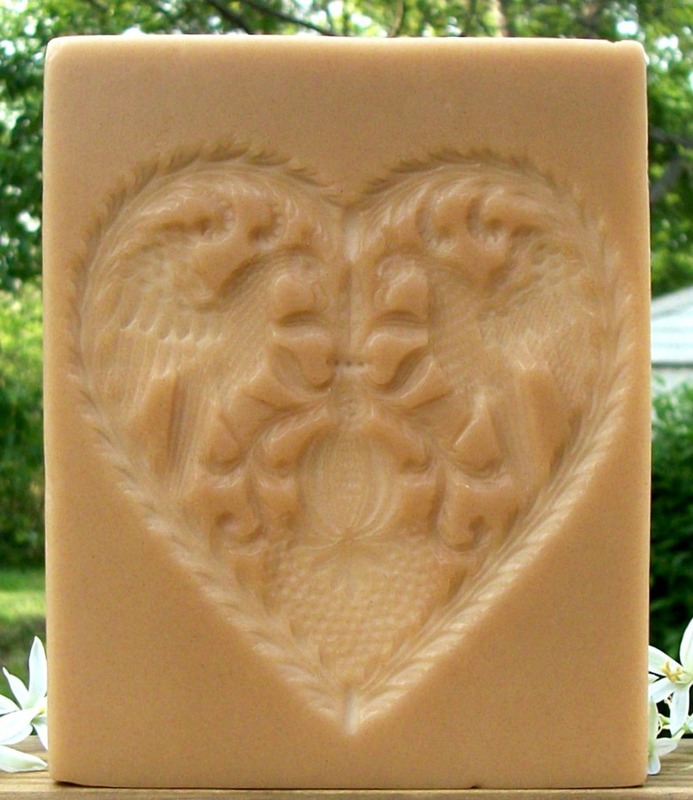 This design is available in 3 different sizes; this mold is the smallest one. Cookies made with mold #480. 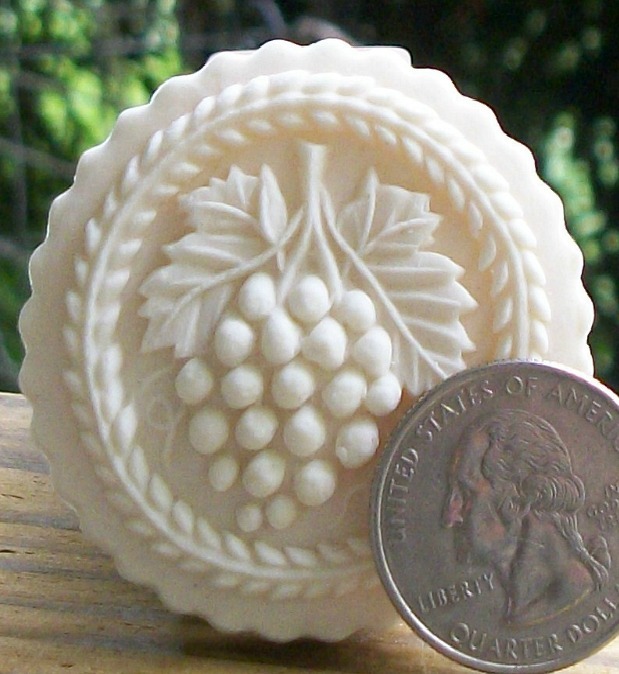 This mold measuring about 3 1/8” in diameter features a cluster of grapes. 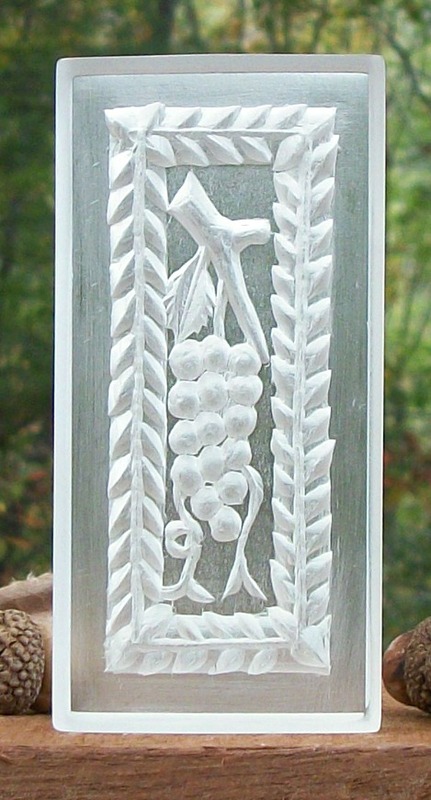 The grapes are surrounded with by a decorative border that helps to round out the image. The depth of the image is great and the details are very nice. The mold will produce a nice cup cake topper. This mold is #1675 and sells for $35.40. This mold is also available in a smaller size (#420). 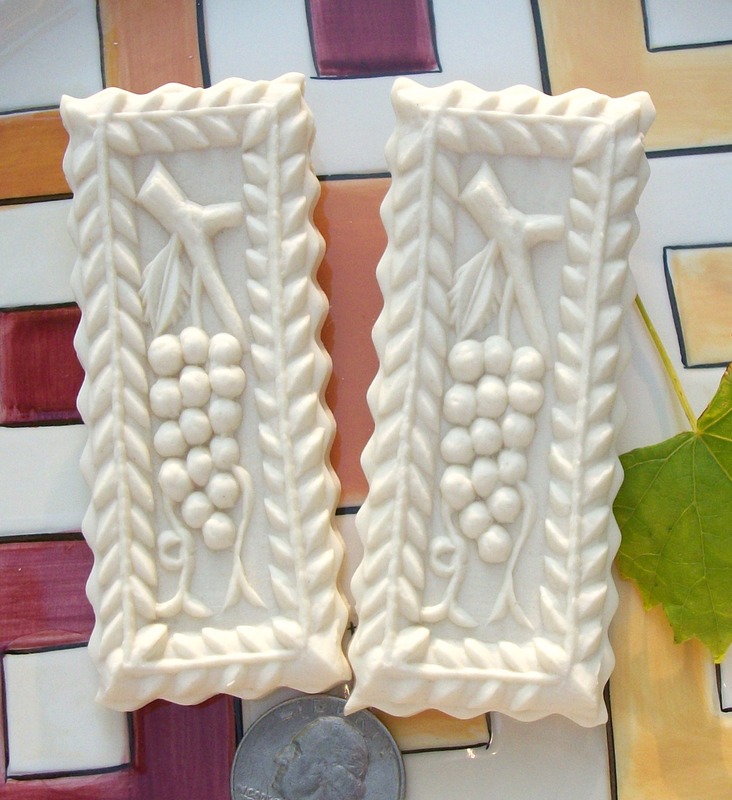 #420 Small Calw Grapes Mold – $21.75. 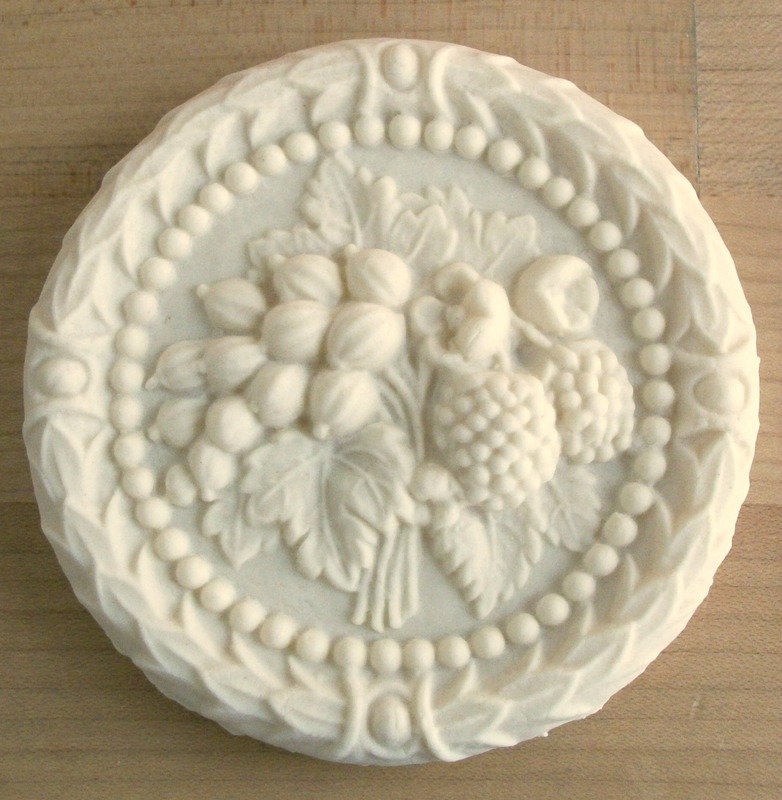 This mold measuring about 1 13/16” in diameter features a cluster of grapes. 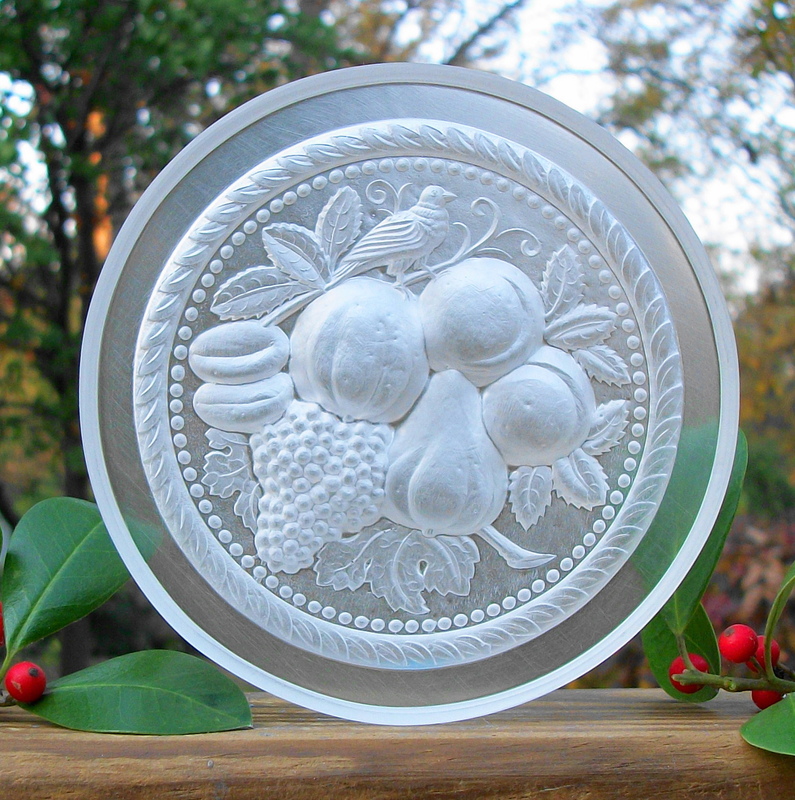 The grapes are surrounded with by a decorative border that helps to round out the image. The depth of the image is great and the details are very nice. This mold is a smaller version of #1675. 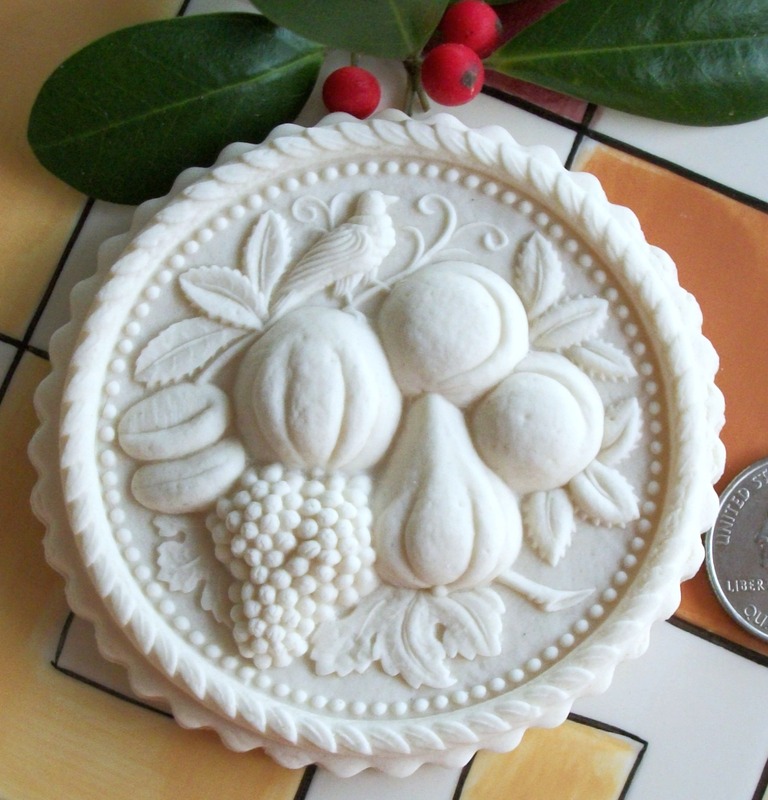 The bigger version is great to make a small cake topper while this smaller mold will produce very detailed and dimensional cookies and confections. This mold is #420 and sells for $21.75. Cookie made with mold #420. 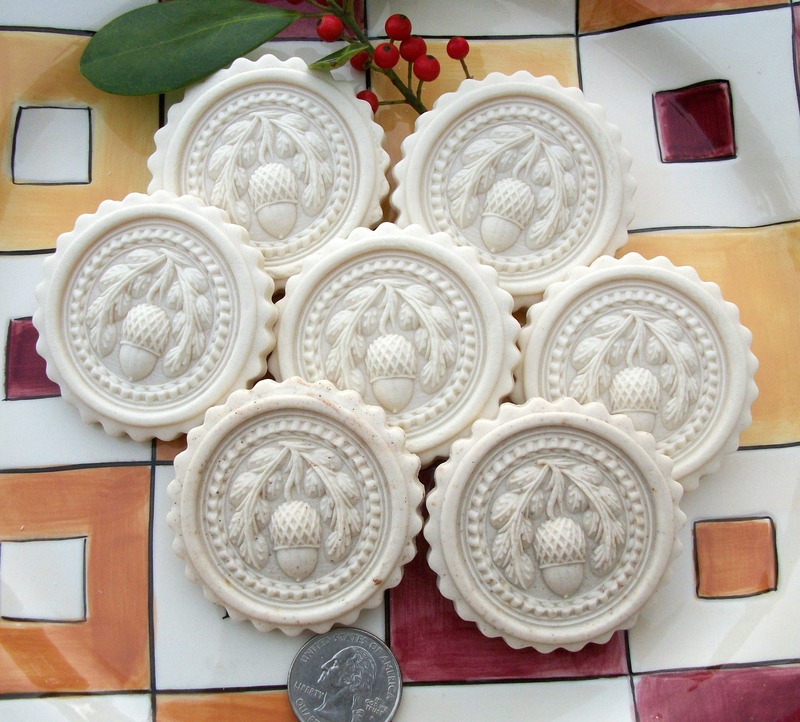 #1889 Brökel Pomegranate Mold – $11.63. 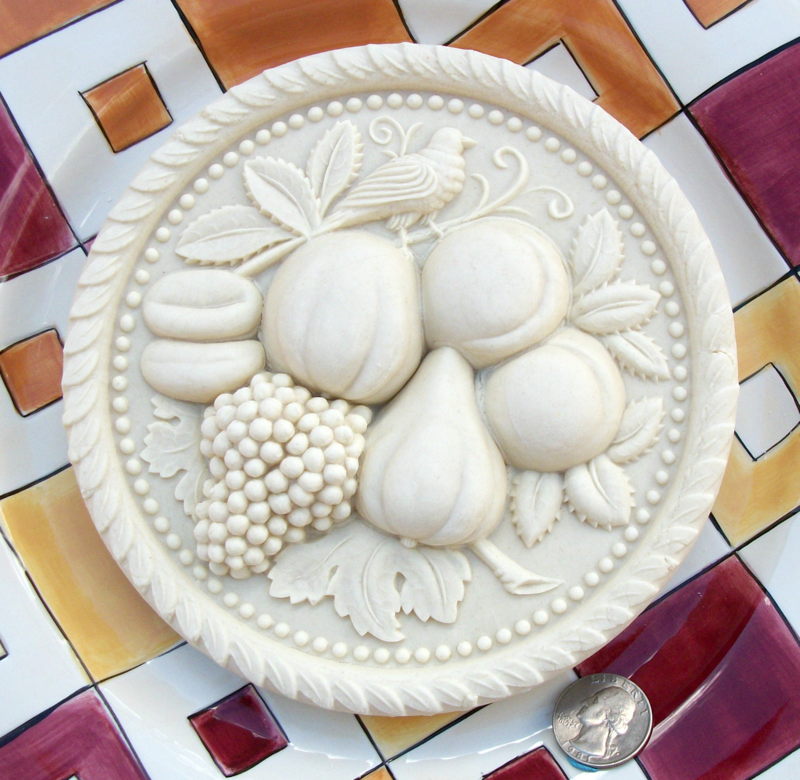 This mold measures about 1 1/2″ x 1 1/8″ and features a Pomegranate fruit. The details are all very nice from the depth and dimension of the fruit to the leaves and the stem. The image has a beautiful border design which adds nicely to the overall appearance of the design. This mold has a groove around its sides to help assist in lifting after pressing. A perfect one bite size. 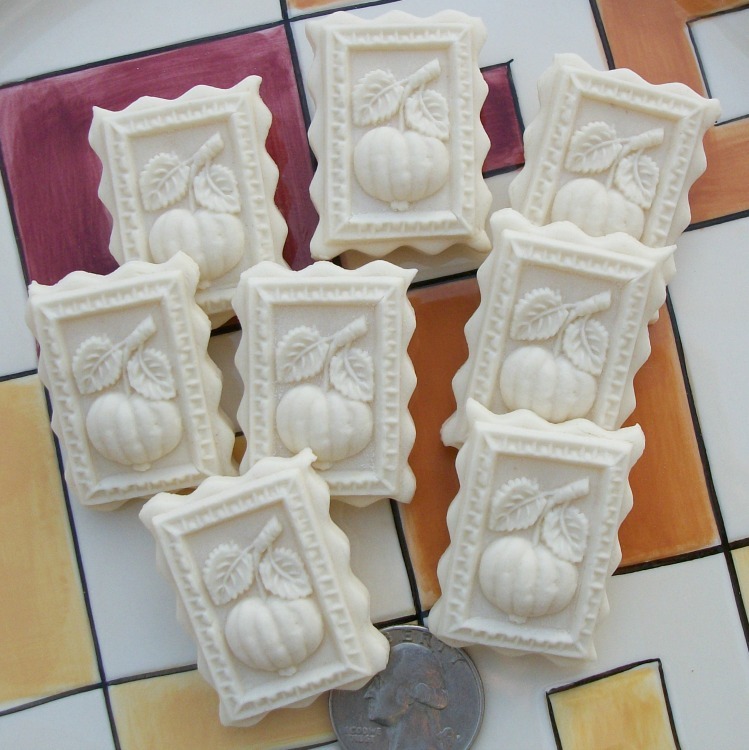 Perfect size mold for a making a “taste” cookie, a butter mint, Marzipan candy or other Confection. 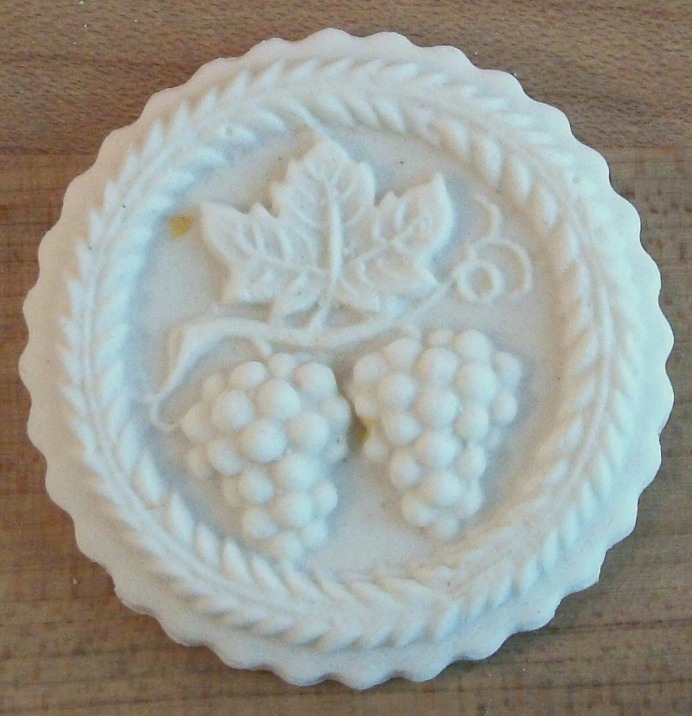 This mold is #1889 and sells for $11.63. 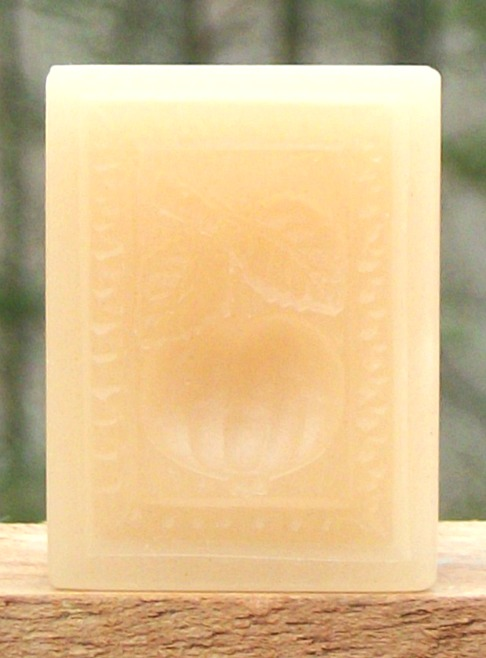 Clear and color copies of this mold will cost an additional $1.45. #1889 Brökel Fruit Mold in Blue, Clear, Pink, and Yellow. 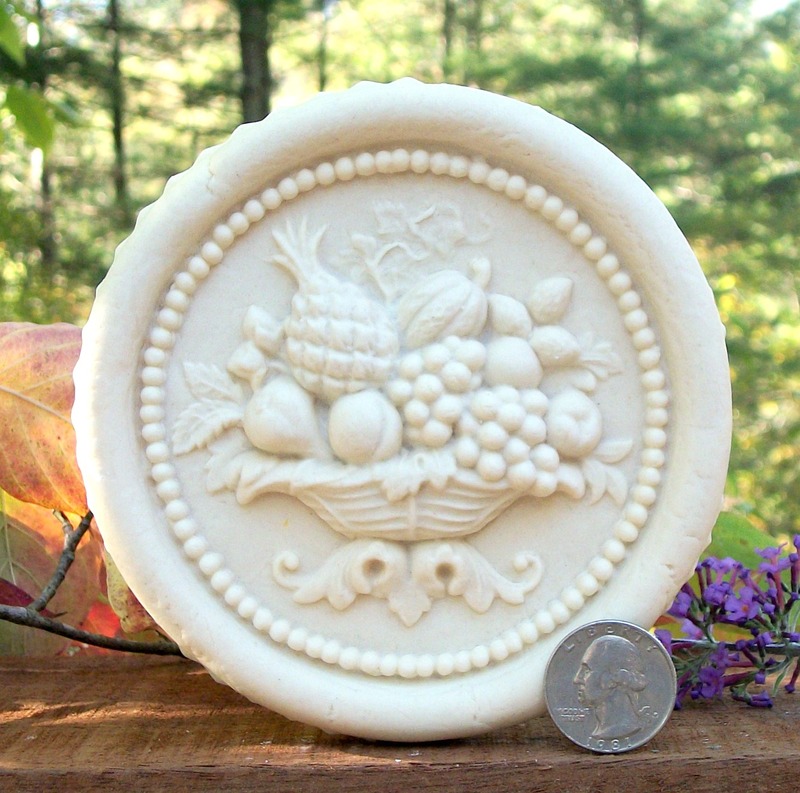 This mold measures about 5 3/4” in diameter and features a bowl of fruit. There is a very nice plain circular design on the other rim of the design with a very small inner design of small pearls that ring the design of the bowl with fruits. Details are abundant on this image from the beautiful design of the bowl to the fine details of the individual fruits and leaves. 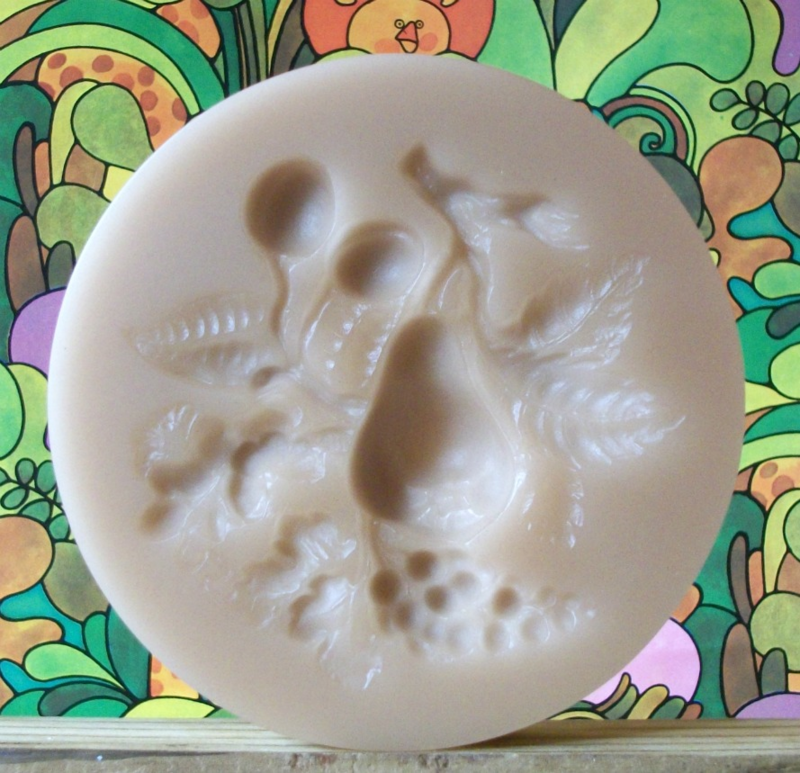 The original mold was sent to us by Frau Bläsius from Koblenz Germany. 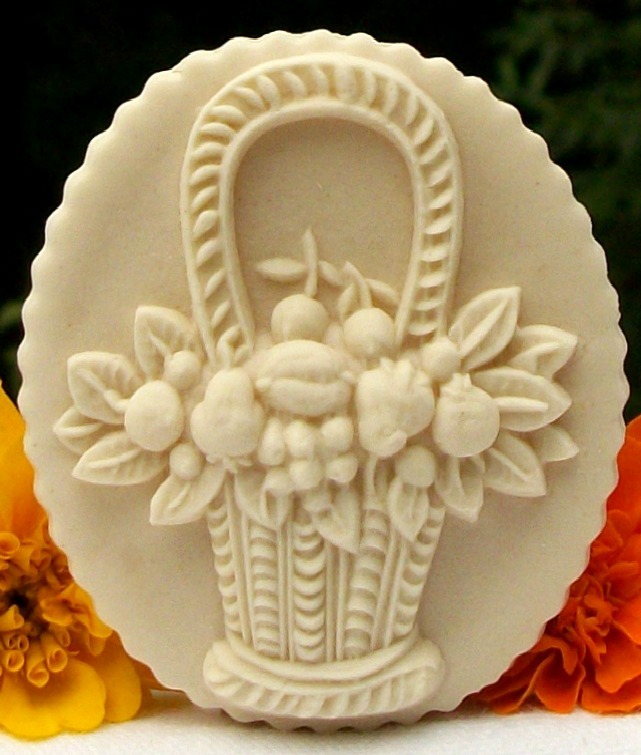 The mold was originally designed for use with Marzipan to produce cake toppers but it also works well with some cookie doughs. 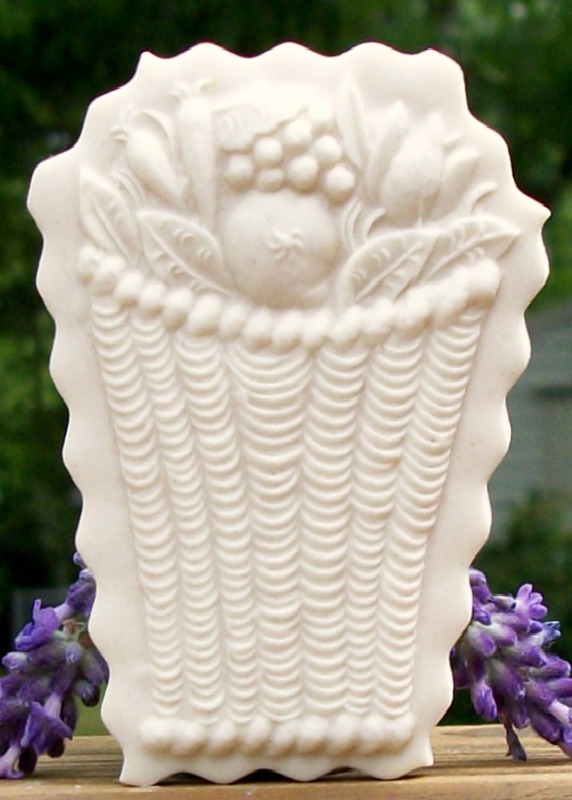 This mold is #1925 and sells for $45.54. 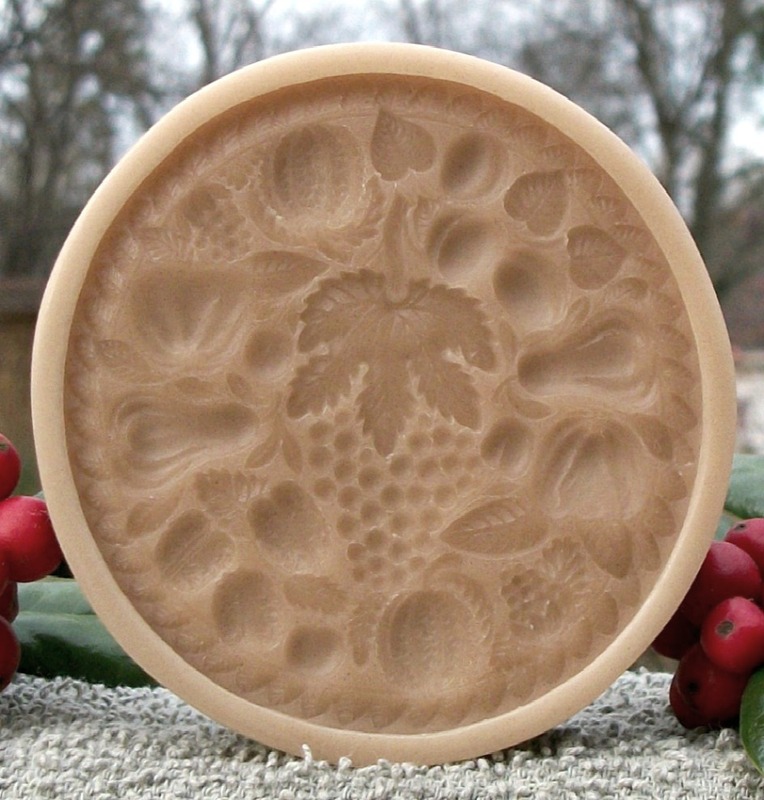 Clear and tinted copies of this mold will cost an extra $5.69. 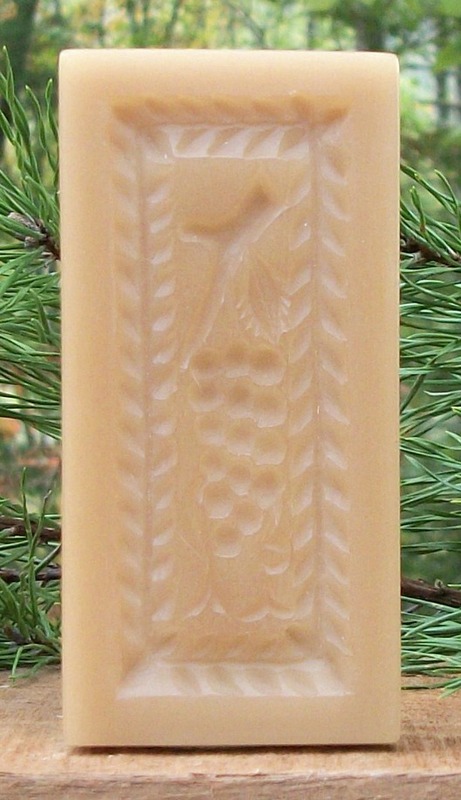 This mold is also available in a smaller size (#491). #491 Small Koblenz Basket of Fruit Mold – $33.14. 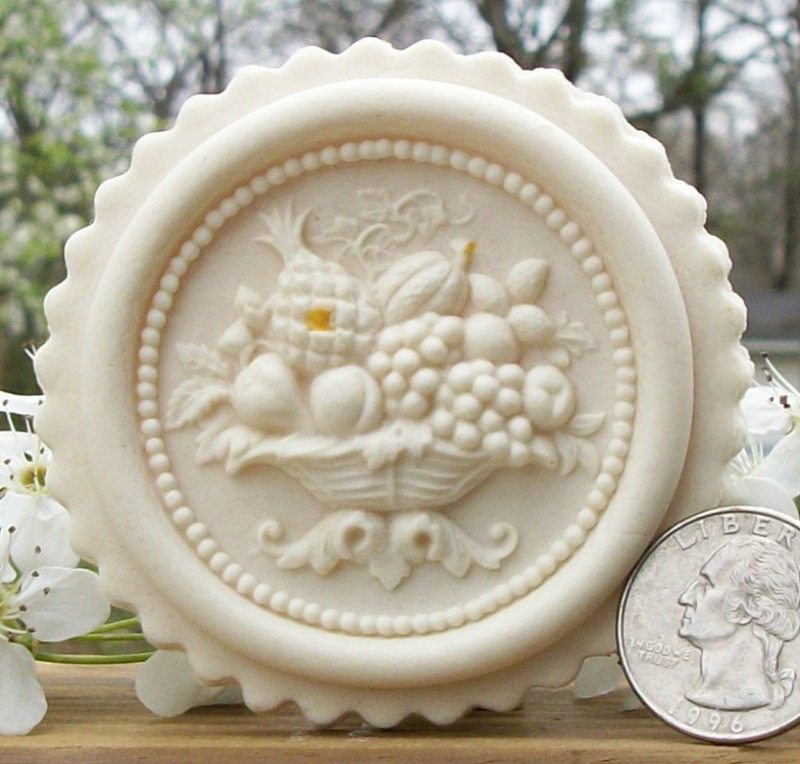 This mold is the smaller version of our mold #1925 and measures about 2 7/8” in diameter and features a bowl of fruit. There is a very nice plain circular design on the other rim of the design with a very small inner design of small pearls that ring the design of the bowl with fruits. Details are abundant on this image from the beautiful design of the bowl to the fine details of the individual fruits and leaves. Simply beautiful! 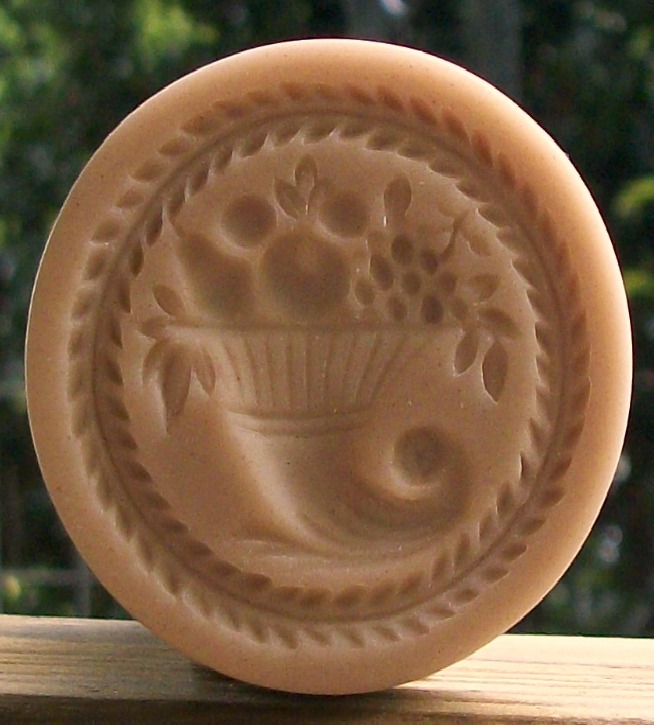 I would use this mold for cookies or Marzipan to produce a cup cake topper. This mold is #491 and sells for $33.14. Cookie made with mold #491. #491 Small Koblenz Basket of Fruit Mold in Clear, Blue, Pink and Green. 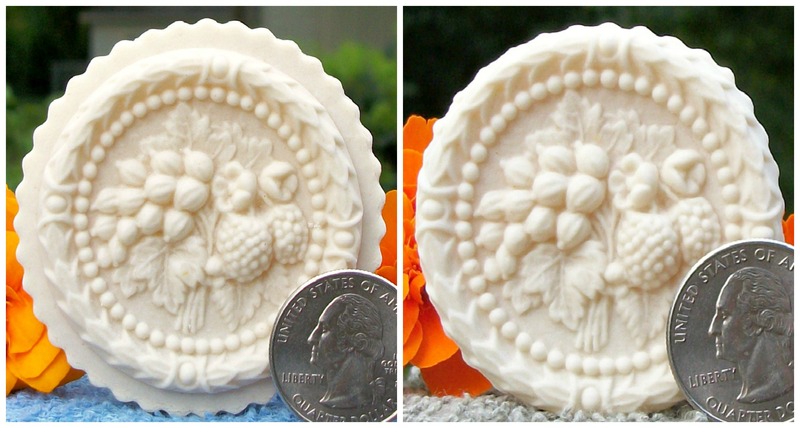 This Marzipan mold measures about 4″ in diameter and the images are very deep and detailed. The image is of a bird sitting on an assortment of varied fruits. Fruits such as grapes, plums and a pear. There is a deep beautiful border of detailed leaves surrounding the whole image. 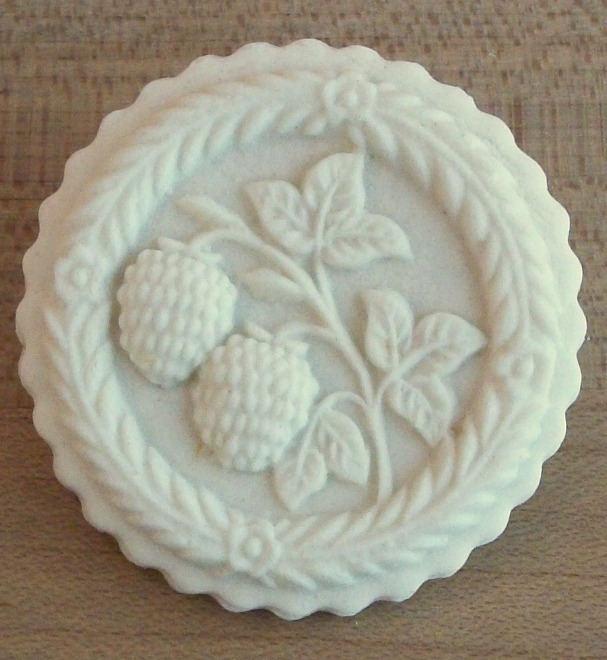 This mold can also be used for making cookies, confections and art work or as a muffin topper. 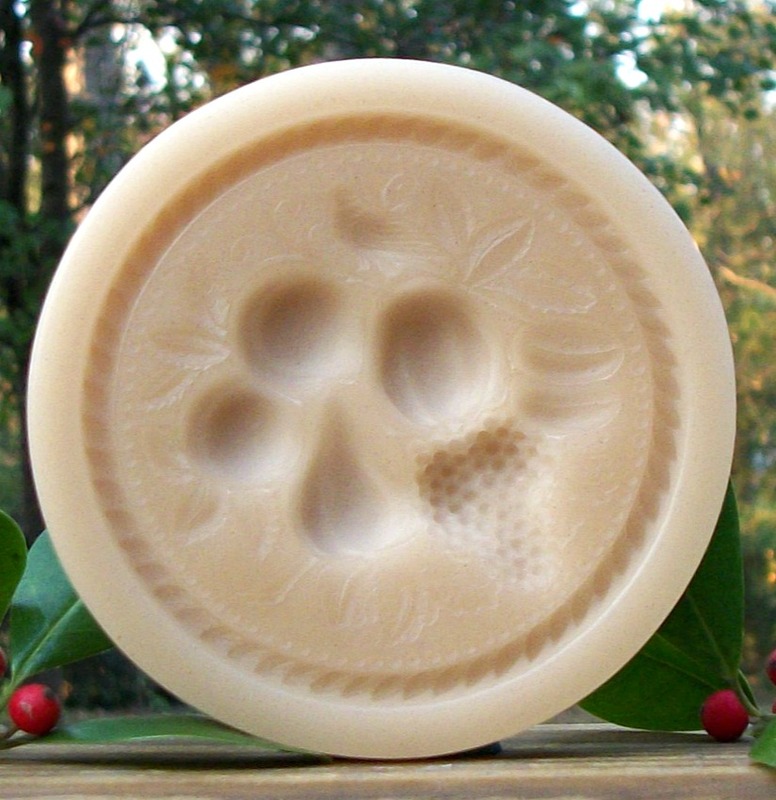 This mold is available in 3 sizes; this is the middle one. This mold is #516 and sells for $45.89. It is available in clear and tinted colors for an extra $5.74. Cookie made with mold #516. 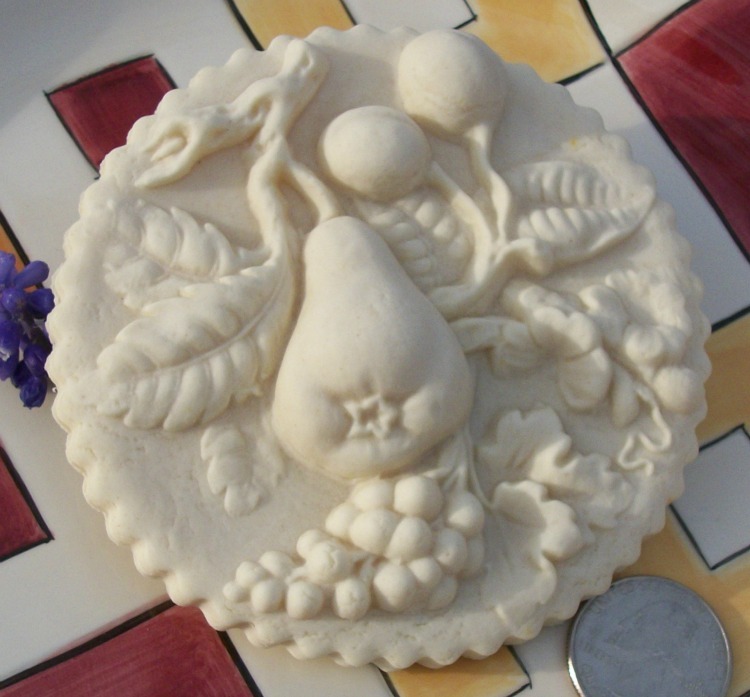 This Marzipan mold measures about 3 3/8″ in diameter and the images are deep and detailed and feature a bird sitting on an assortment of varied fruit. There is a double border; the first is of single dots and the second border is of leaves. 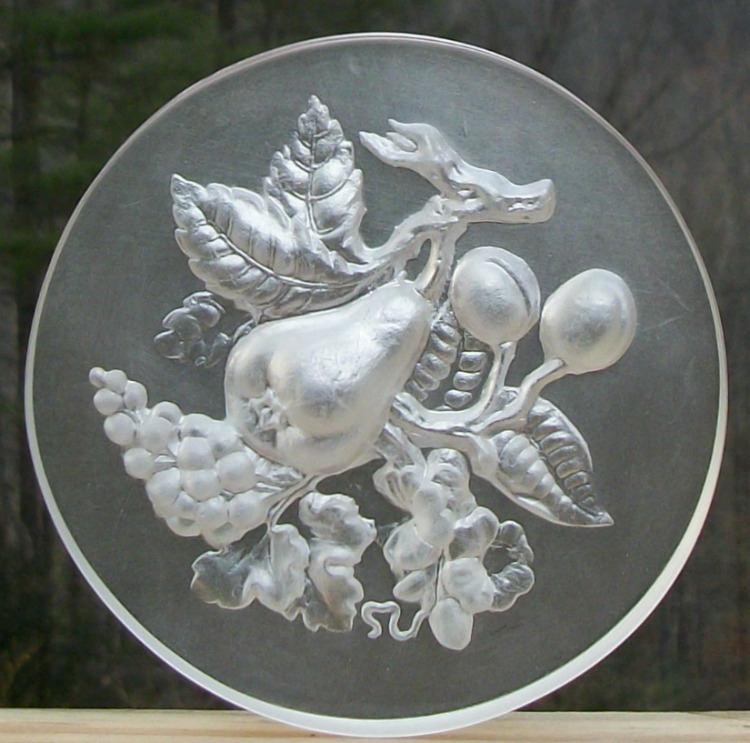 The mold can also be used for making cookies, confections and art work or as a muffin topper. 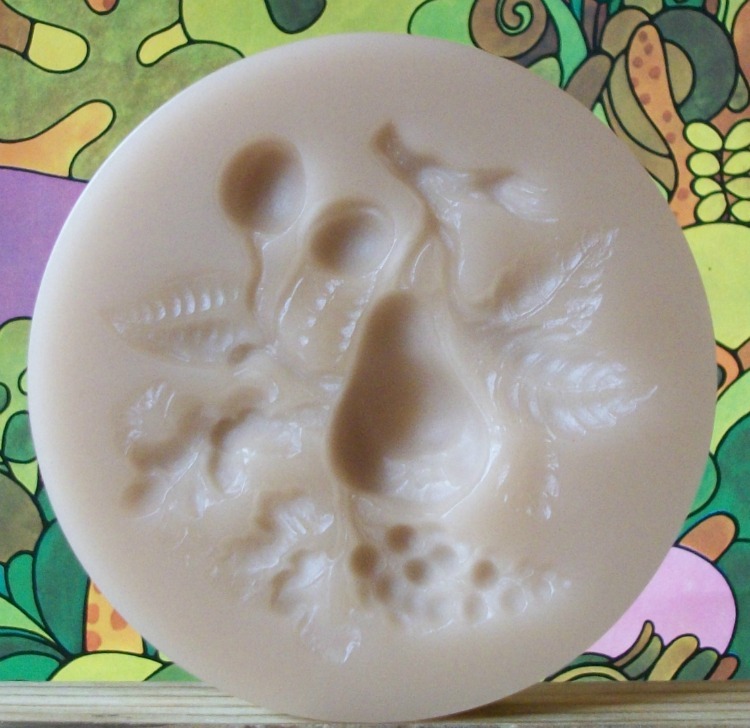 This mold is #535 and sells for $39.86 and is available in clear and tinted colors for an extra $4.98. 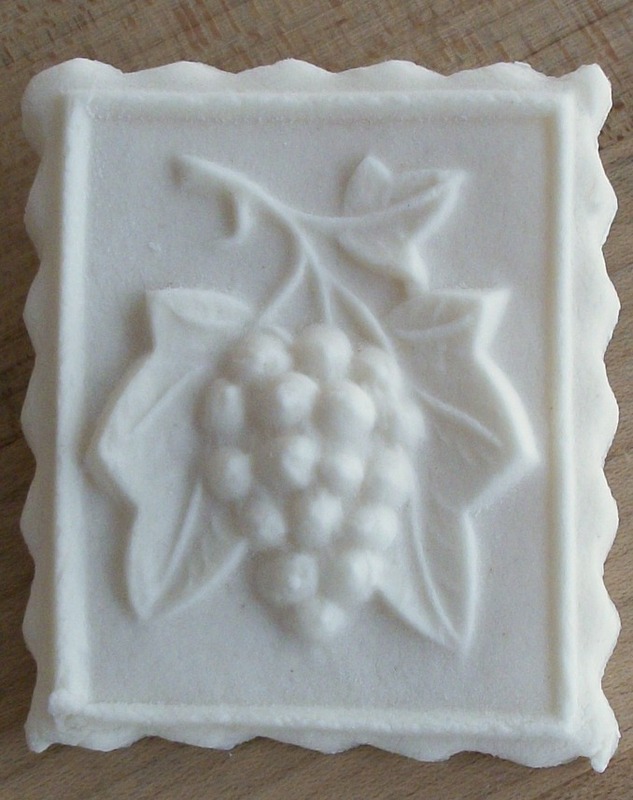 This mold is available in 3 sizes; this is the small one. 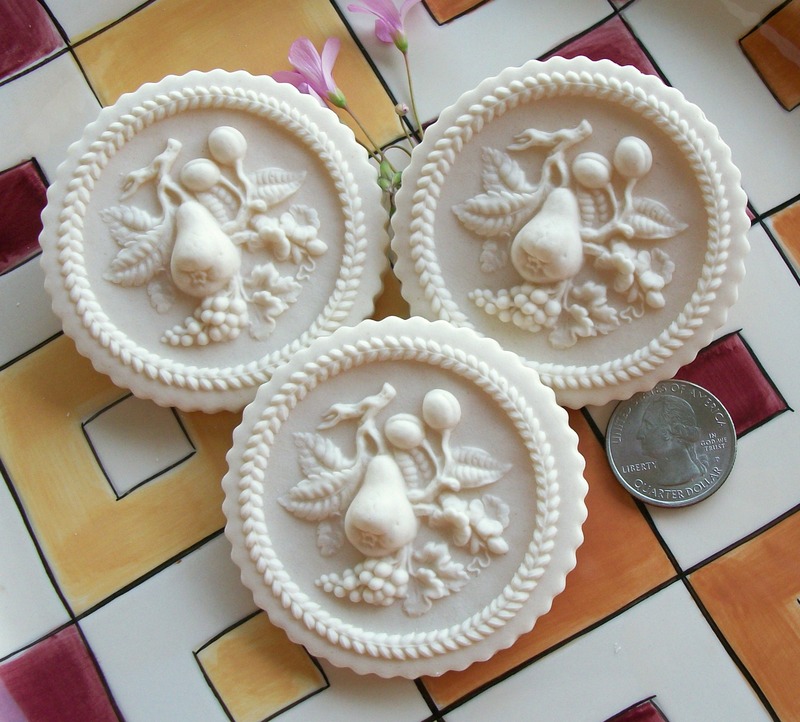 For size comparison, cookies made with mold #1939, #516 Junior and #535 Small Birds and fruits Marzipan mold.